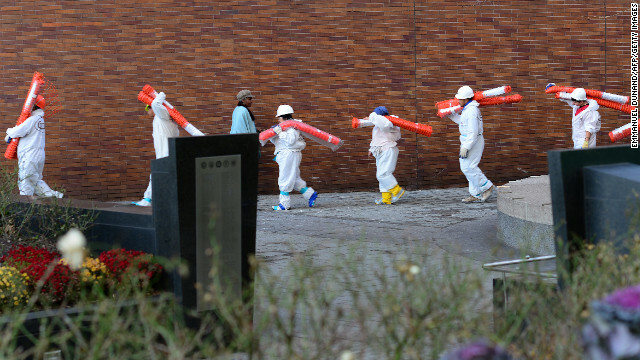 Cleaning crews work in Manhattan's financial district following damage from Superstorm Sandy on Monday, November 12. 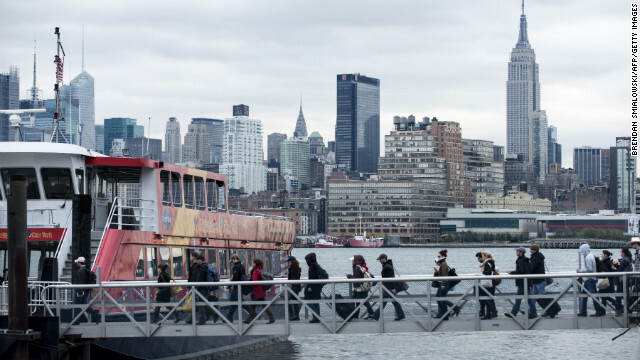 View photos of New York's recovery. 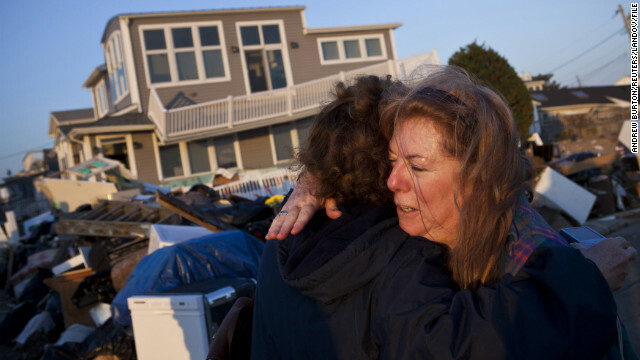 Evelyn Faherty hugs a friend on Sunday, November 11, while discussing the damage done to her home by Superstorm Sandy in the Breezy Point neighborhood of Queens, New York. 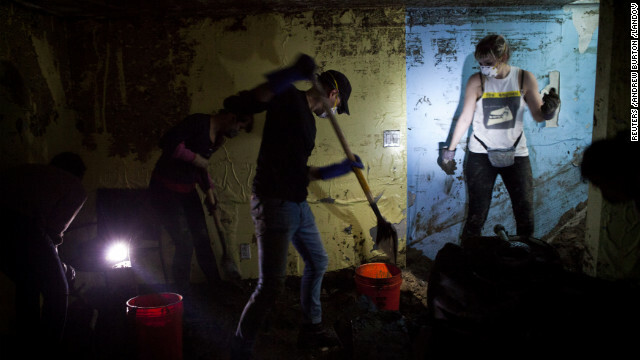 Volunteers shovel sand and water out of the basement of Monir Islam's home in the Rockaway Park neighborhood of Queens, New York, on Sunday. 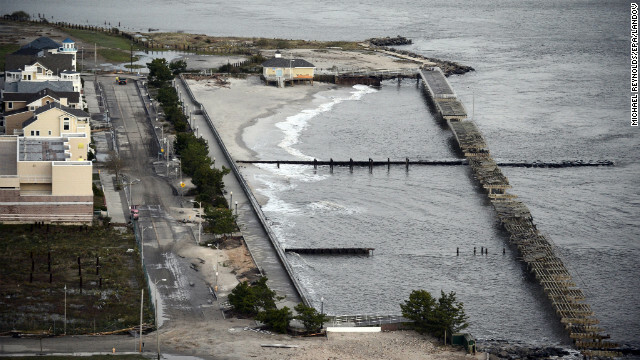 The Rockaways peninsula in Queens was one of the areas hardest hit by Sandy. 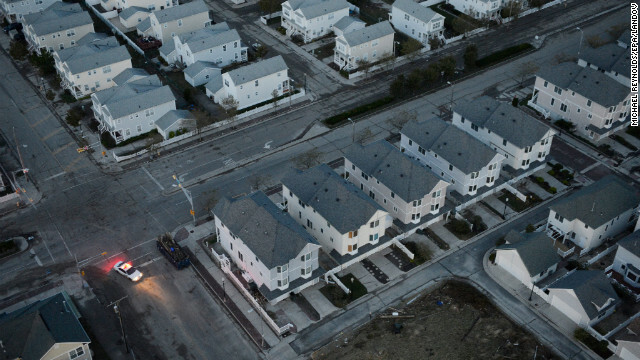 See photos of Rockaway's continuing struggles. 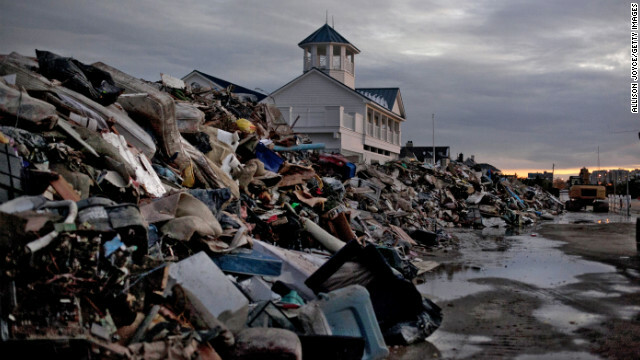 Furniture and other belongings are strewn under and around a beach house damaged by Sandy on Saturday, November 10, in Mystic Island, New Jersey. 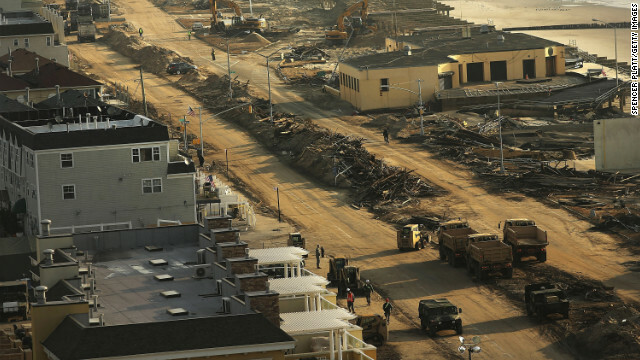 Streets in Ortley Beach, New Jersey, were destroyed by Sandy. 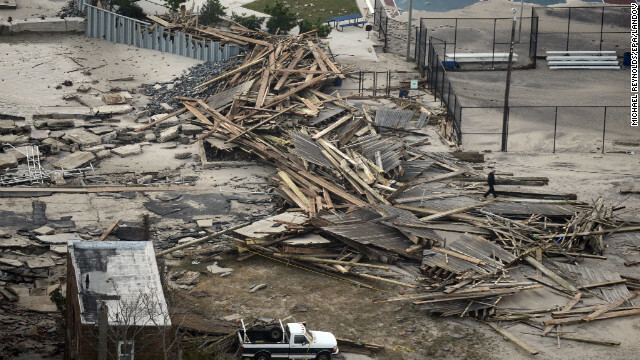 Clean-up continues on Saturday, November 10 among piles of debris where a large section of the iconic boardwalk was washed away in the heavily damaged Rockaways. 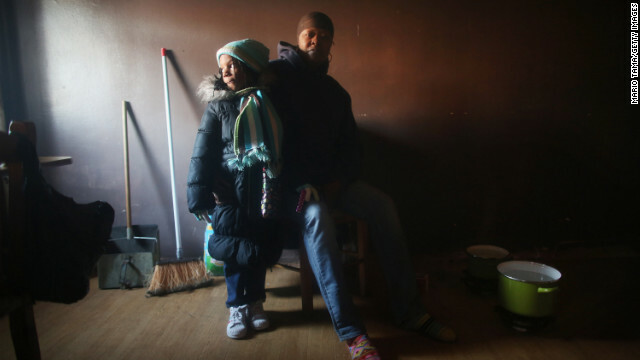 Mac Baker, right, poses with her niece Nytaisha Baker next to pots of water she heats on the floor with small flames for a bit of warmth in Baker's unheated apartment in the Ocean Bay public housing projects in the Far Rockaway neighborhood in Queens on Friday, November 9. 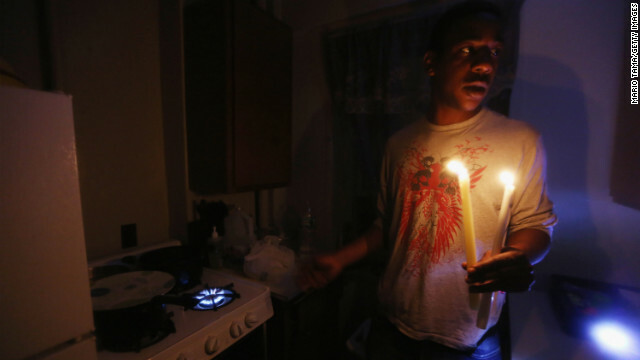 Theresa Goddard, her apartment still without electricity, is overwhelmed while discussing her living conditions on Thursday, November 8, in the Brooklyn borough of New York. 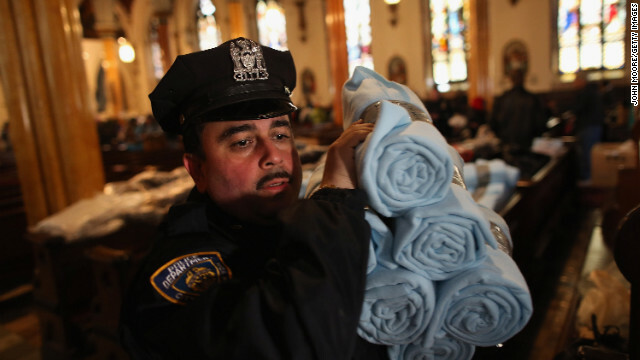 A police officer carries blankets donated by Ikea for people affected by Superstorm Sandy in Brooklyn. 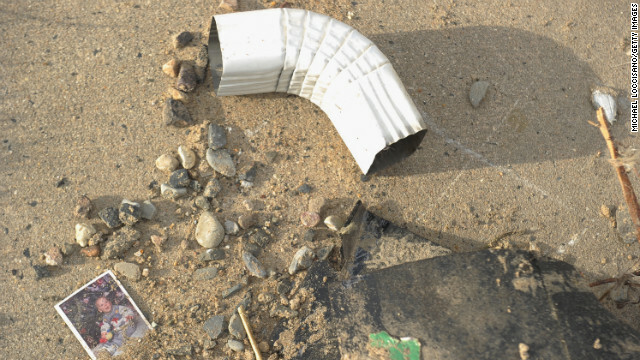 Debris from Superstorm Sandy is seen on a beach Thursday in Long Branch, New Jersey. 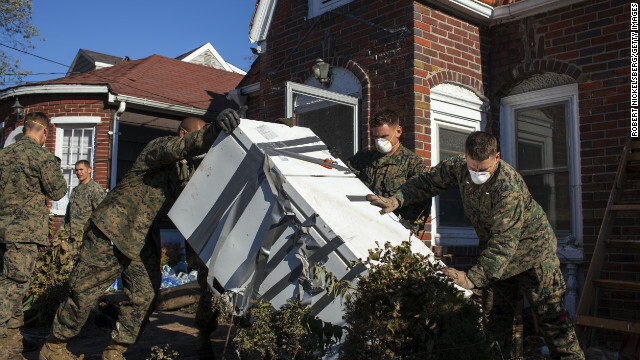 Troops from the 26th Marine Expeditionary Unit and the U.S. Navy help local residents remove household items damaged by Superstorm Sandy on November 6, in the New Dorp Beach neighborhood of Staten Island, New York. 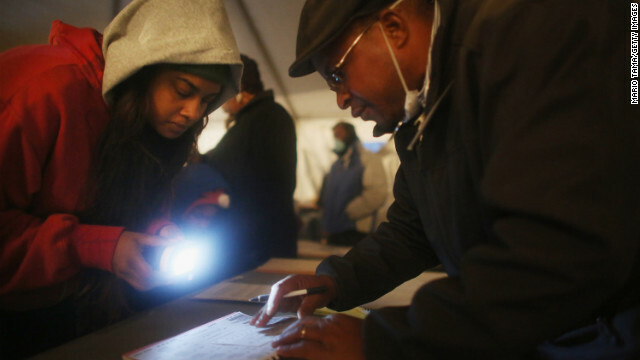 Voter Sheresa Walker uses a flashlight for poll worker Lloyd Edwards in a tent set up as a polling place in Queens, New York. A poll worker directs people to a temporary polling center in the Coney Island section of Brooklyn, New York. 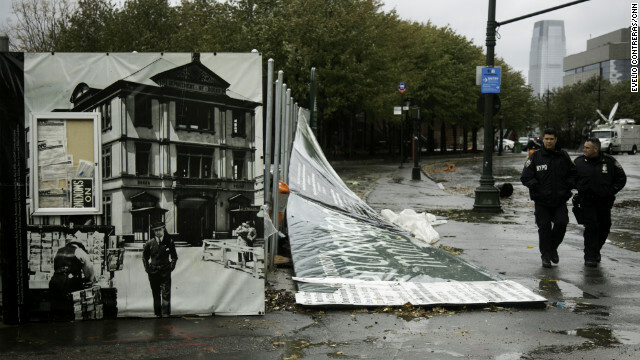 Polling sites in Coney Island and the surrounding area were damaged during Superstorm Sandy. 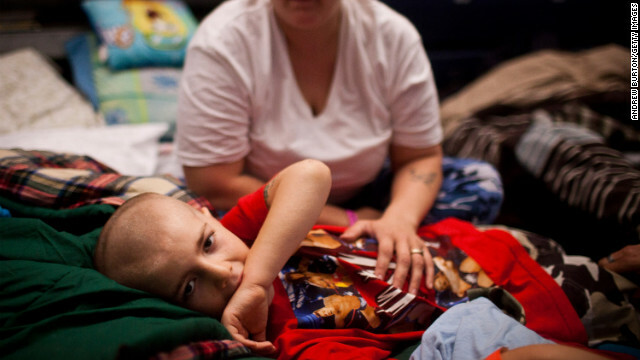 Michael Fischkelta, 8, lies on his cot with his mother, Jenifer Wilson, in a Red Cross evacuation shelter set up in the gymnasium of Toms River High School on Monday, November 5, in Toms River, New Jersey. View photos of the recovery efforts in New York. 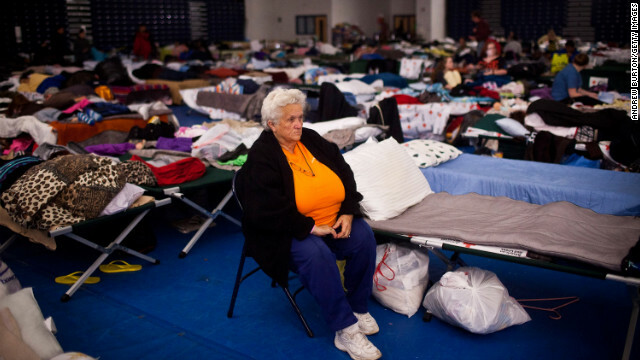 Ruth Hawfield sits next to her cot Monday in a Red Cross evacuation shelter at Toms River High School. 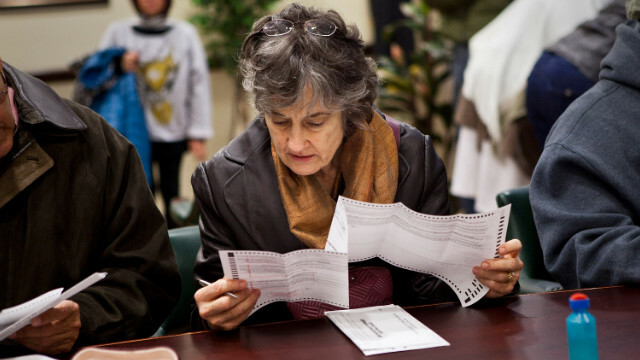 A woman fills out an early voting ballot on Sunday, November 4, in Jersey City, New Jersey. Gov. 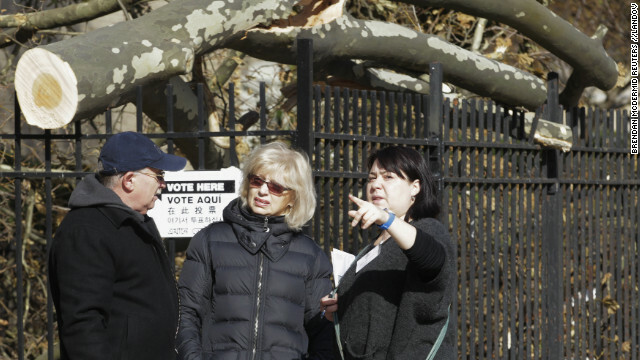 Chris Christie ordered early voting stations to stay open through the weekend in an effort to get people to vote despite the damage done by Superstorm Sandy. 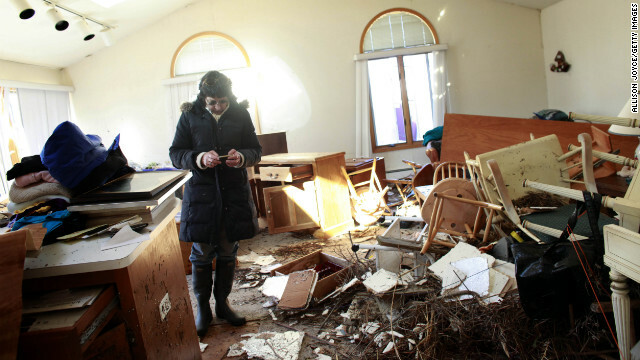 A woman sifts through her mother's damaged home for items to save Sunday in the Breezy Point neighborhood of Queens, New York. 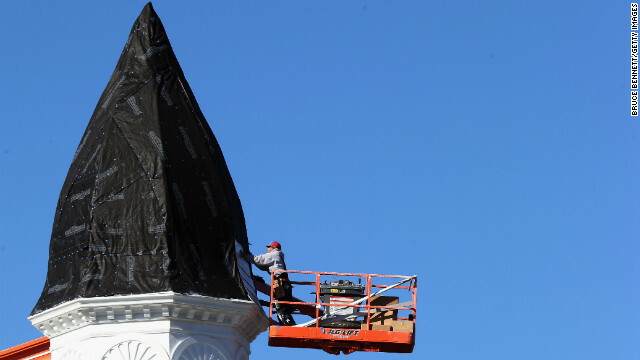 A workman repairs damage to the steeple of the First United Methodist Church on Sunday in Port Jefferson, New York. 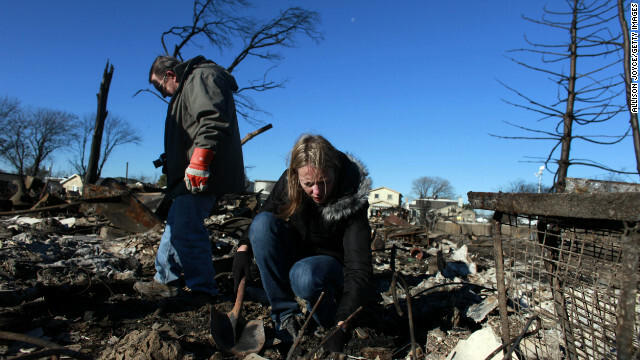 People sift through their damaged home on Sunday in Breezy Point. A statue of a firefighter stands in front of a burned down house Sunday in Rockaway, New York. 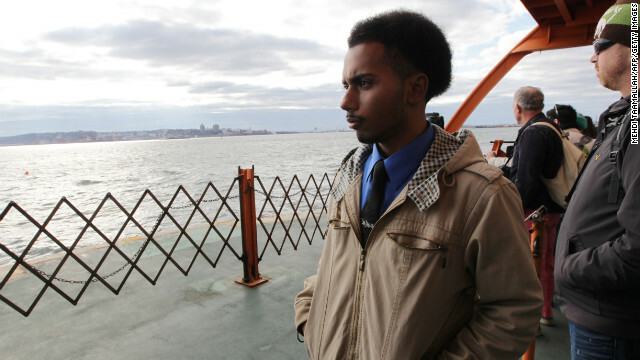 Abraham Cambrelen, 19, takes the Staten Island Ferry to go check on his mother Sunday while New York recovers from Hurricane Sandy. 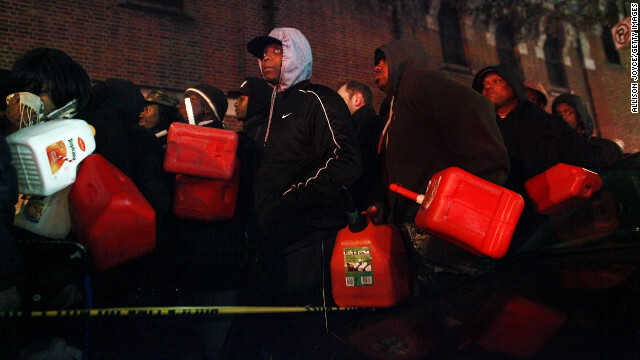 Crowds wait for free gas on Saturday, November 3, at the Bedford Avenue Armory in Brooklyn, New York. 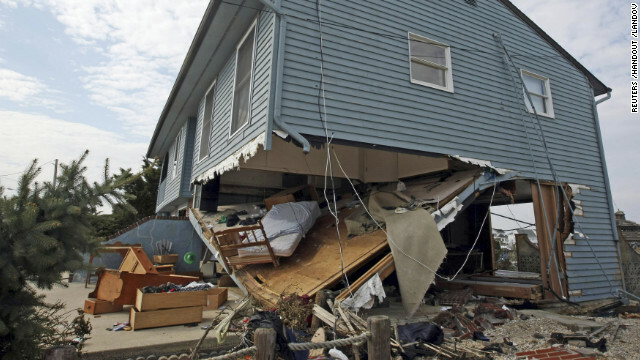 A house sits devastated by Superstorm Sandy on Friday, November 2, in Union Beach, New Jersey. 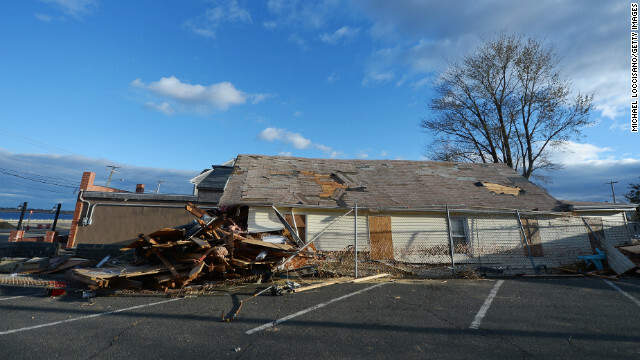 The cost of the storm's damage in the U.S. is estimated at between $30 billion and $50 billion, according to disaster modeling firm Eqecat. A baby picture lies beneath rubble in a neighborhood devastated by the storm in Union Beach on Friday. 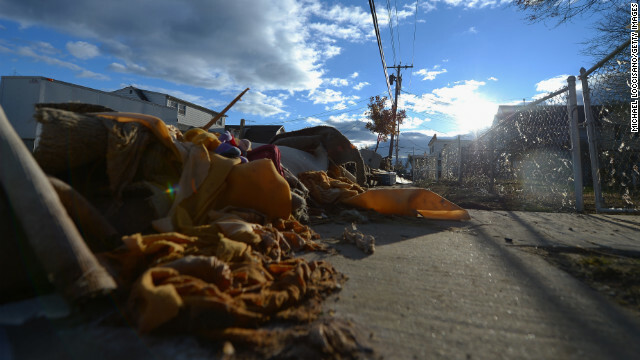 Flood-damaged belongings sit on the side of the road in Union Beach on Friday. 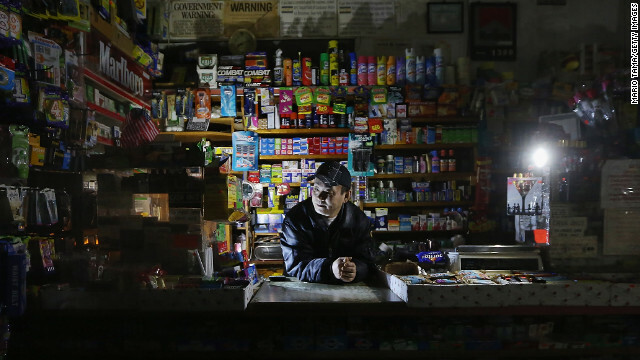 Park Choul works by flashlight in his deli in New York's East Village on Thursday, November 1. 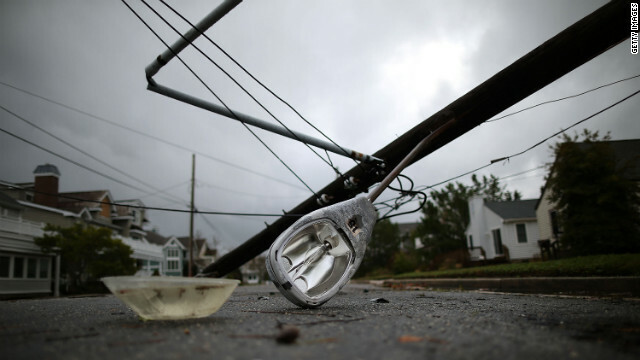 More than 3.3 million customers remained without electricity in 15 states and the District of Columbia four days after Sandy barreled ashore. 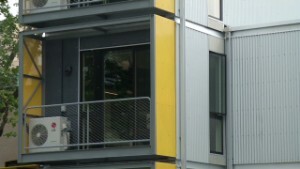 Geronimo Harrison's apartment in the East Village remains without power or water Thursday. He's using candles for light and a gas stove for heat. 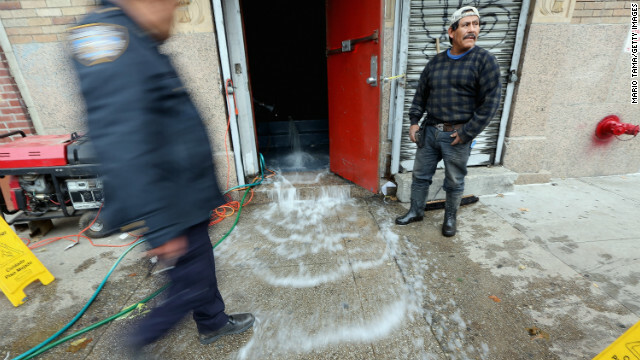 Water gets pumped out of a business in the East Village on Thursday. 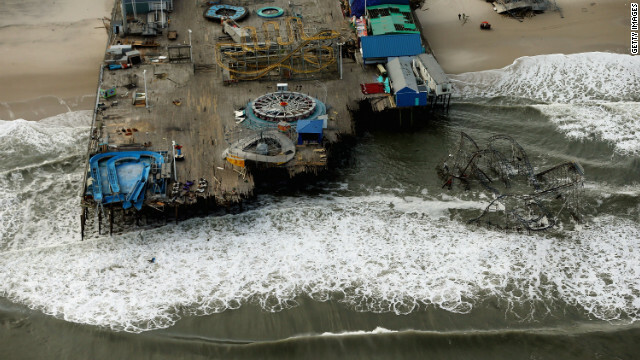 A roller coaster sits in the Atlantic Ocean on Thursday after the Fun Town pier it sat on in Seaside Heights, New Jersey, was destroyed by Superstorm Sandy. 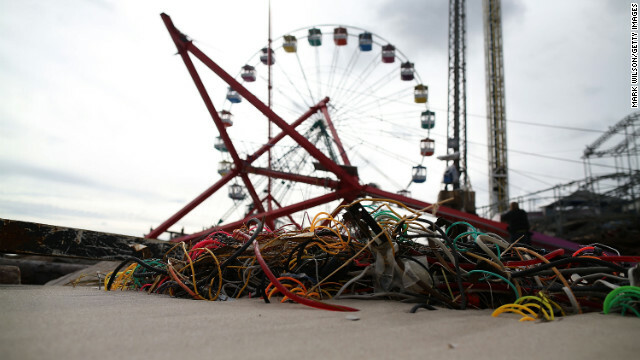 Amusement-park rides lie mangled on the beach after the Fun Town pier in Seaside Heights was destroyed. 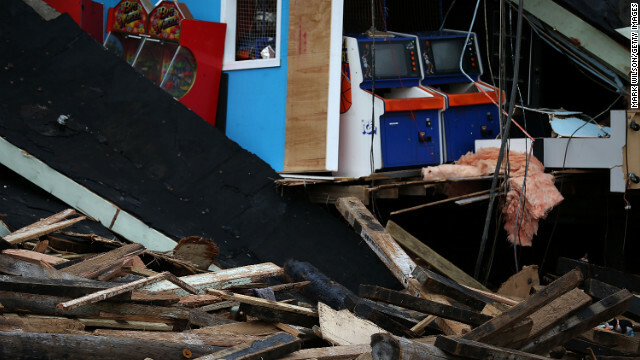 The arcade at the FunTown pier in Seaside Heights is in ruins. 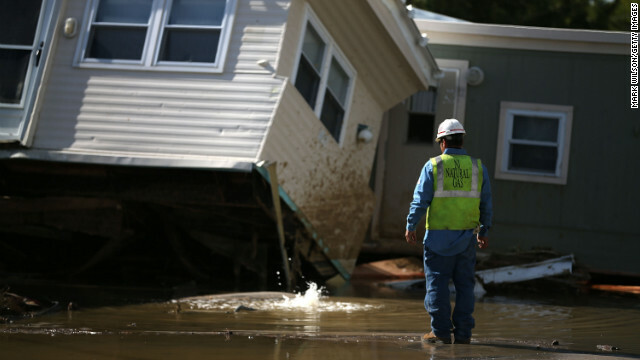 Storm damage is expected to cost tens of billions of dollars. 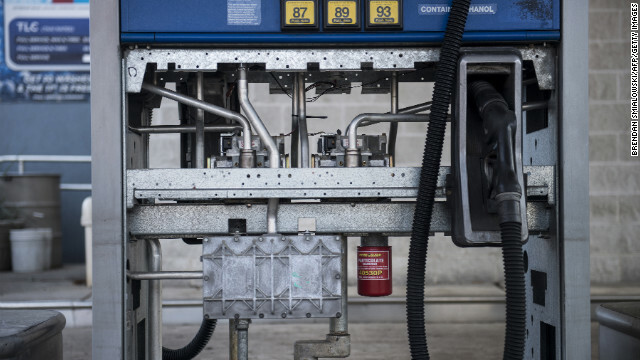 The inside of a gas pump is exposed at a closed station that was recently under floodwater on Thursday, November 1, in Hoboken, New Jersey. 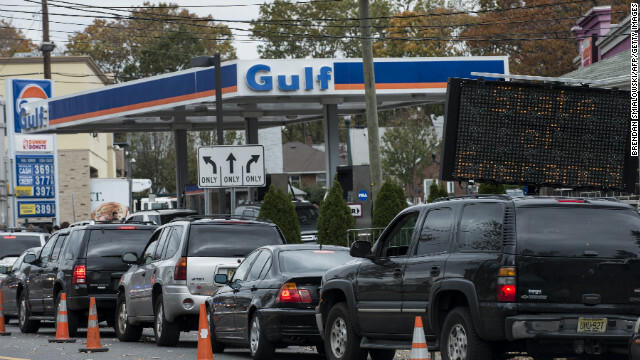 Superstorm Sandy, which made landfall along the New Jersey shore, has left the state with a fuel shortage due to logistical problems and power failures. 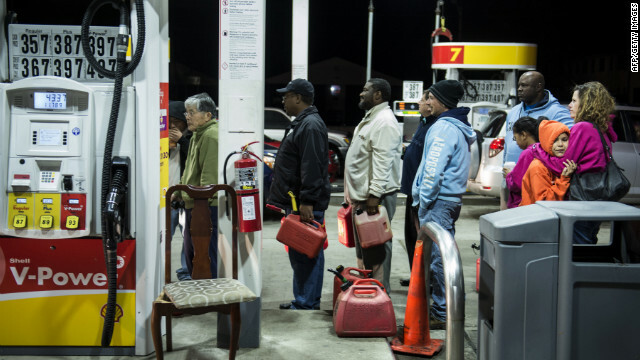 People wait in line for fuel at a Shell Oil station onThursday in Fort Lee, New Jersey. Fuel shortages have led to long lines of cars at gasoline stations in many states. Cars wait in line for fuel at a Gulf gas station in Fort Lee, New Jersey. 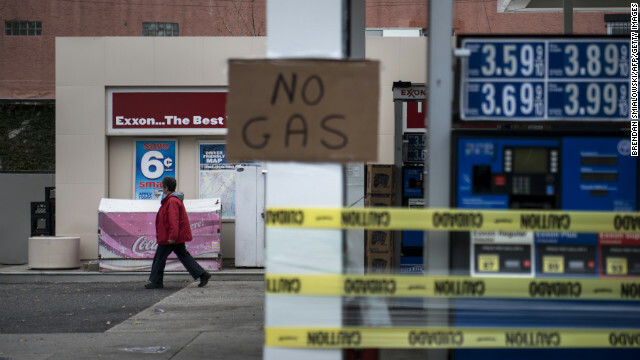 A woman leaves an Exxon gas station that was out of fuel on Thursday in North Bergen, New Jersey. 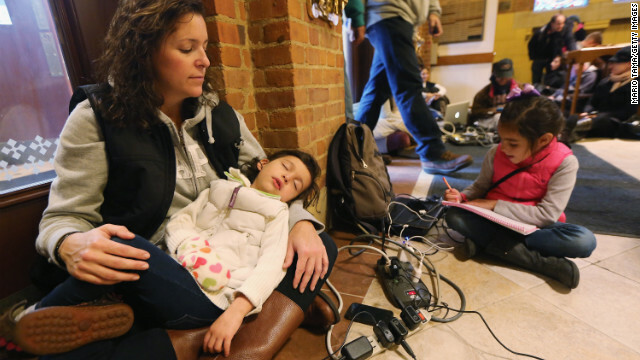 Bridget De La Torre holds her daughter Neve, 3, as daughter Paz sits nearby while they rest and charge devices on Thursday. They were at a shelter for those affected by Superstorm Sandy at Saints Peter and Paul Church in Hoboken, New Jersey. 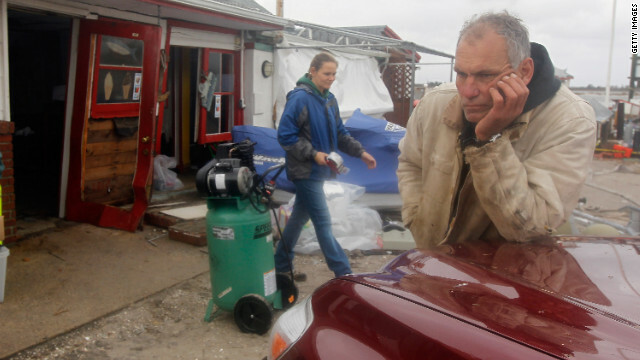 Bridget's family has no electricity or hot water, and their car was destroyed by flooding. 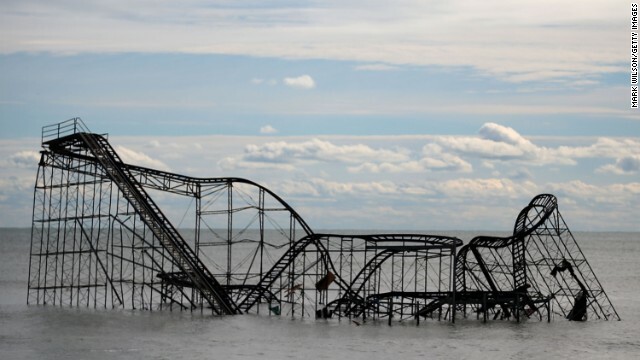 Waves break in front of an amusement park destroyed by Superstorm Sandy on Wednesday, October 31, in Seaside Heights, New Jersey. At least 56 people were killed in the storm. 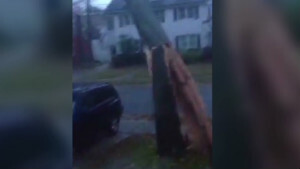 New Jersey suffered massive damage and power outages. 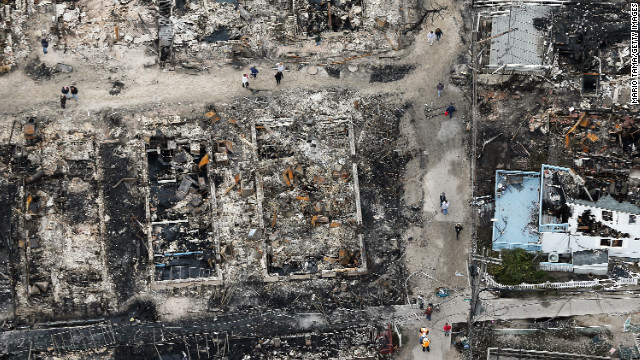 People walk near the remains of burned homes in the Breezy Point neighborhood of Queens, New York, on Wednesday. 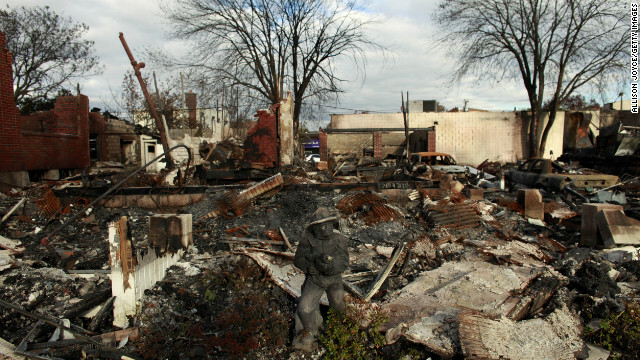 An overview of the fire damage in Queens, New York, following Hurricane Sandy. 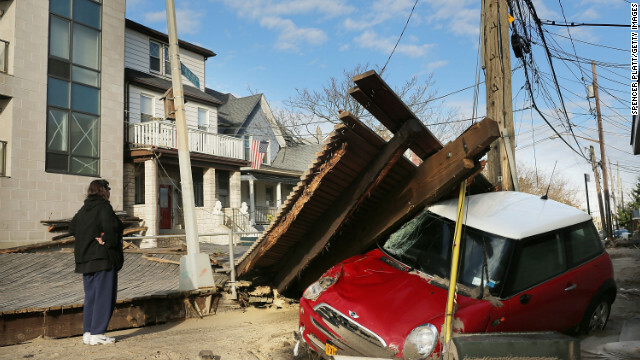 Residents in hard-hit areas sifted through the wreckage of Sandy on Wednesday as millions remained without power. 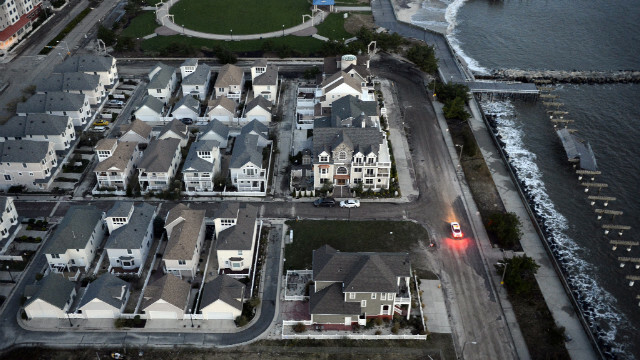 Buildings on the shoreline are pictured from Air Force One as it prepares to land in Atlantic City, New Jersey, carrying President Barack Obama, who visited areas hardest hit by the unprecedented storm. President Barack Obama speaks as New Jersey Gov. 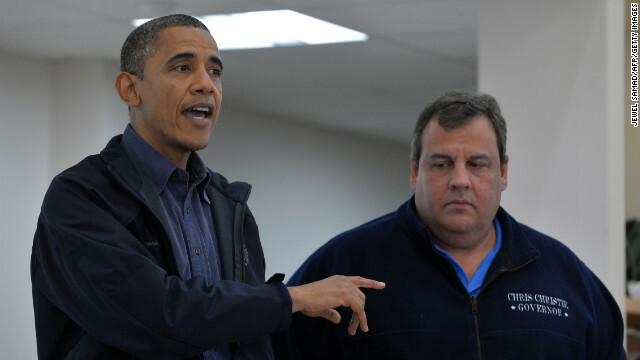 Chris Christie looks on, as they visit a shelter for Hurricane Sandy victims in Brigantine, New Jersey. 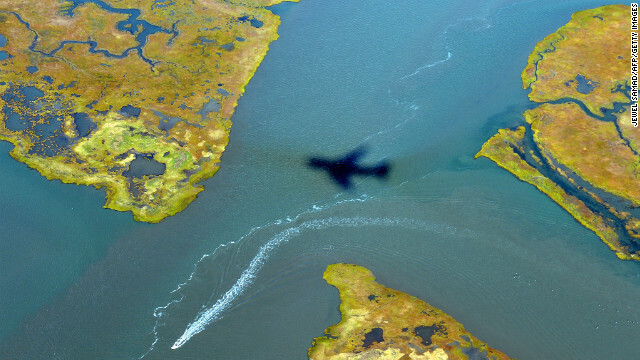 The shadow of Air Force One is cast on the water as it prepares to land in Atlantic City on Wednesday, October 31. 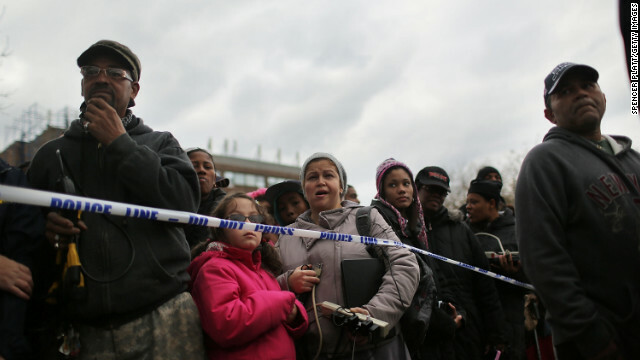 Residents in the Rockaway section of Queens, New York, wait to charge their phones at a government generator. Kennedy International Airport in New York and Newark Liberty International Airport in New Jersey resumed operations on limited schedules Wednesday, and the New York Stock Exchange commenced trading after being closed for two days. 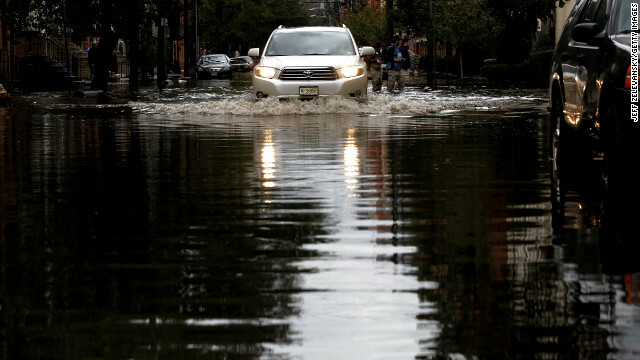 Motorists drive through standing water in Hoboken, New Jersey. 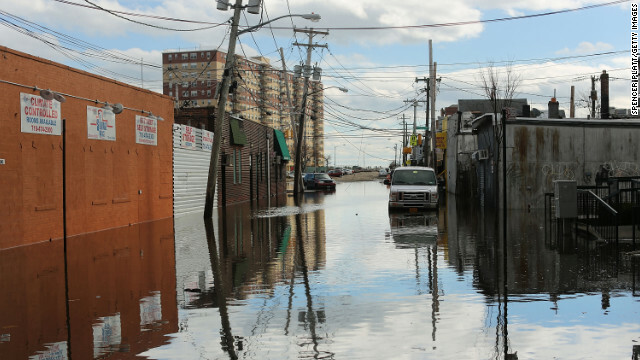 Known as the Mile Square City, the low-lying neighborhoods suffered deep flooding resulting from the storm surge associated with Hurricane Sandy. 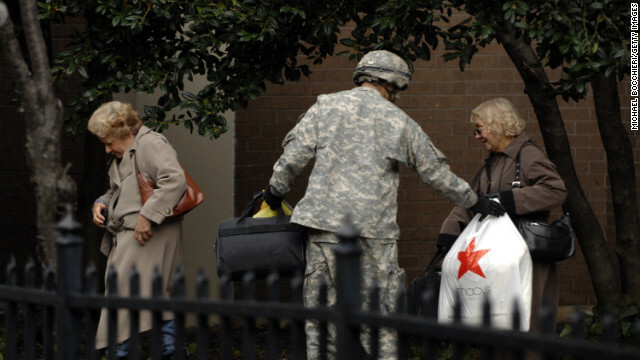 A member of Army National Guard Unit Gulf 250 from Morristown, New Jersey, evacuates victims of Hurricane Sandy in Hoboken on Wednesday, October 31. 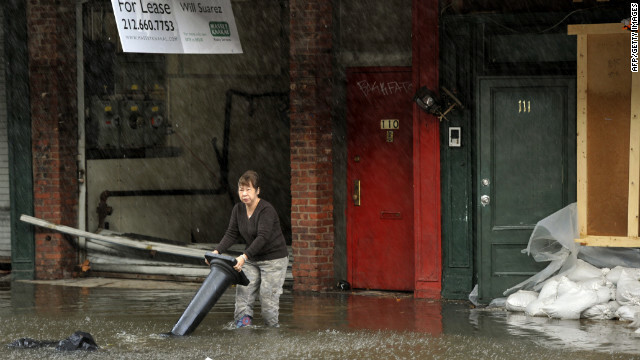 Residents traverse flooded streets as clean up operations begin in Hoboken, New Jersey. New Jersey Natural Gas technician Carlos Rojas inspects a leaking gas main that is under water at a home damaged by Hurricane Sandy in Long Beach Island, New Jersey. 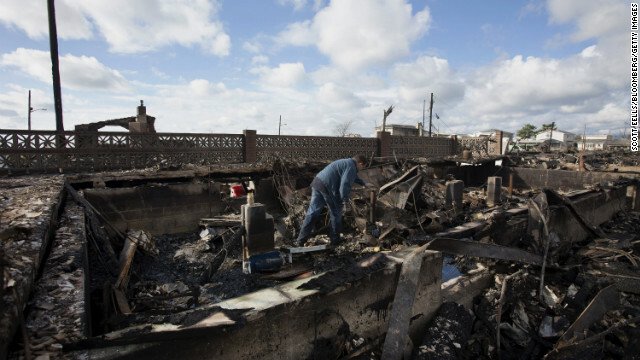 A resident looks through the remnants of his home in the Breezy Point neighborhood of Queens, New York. 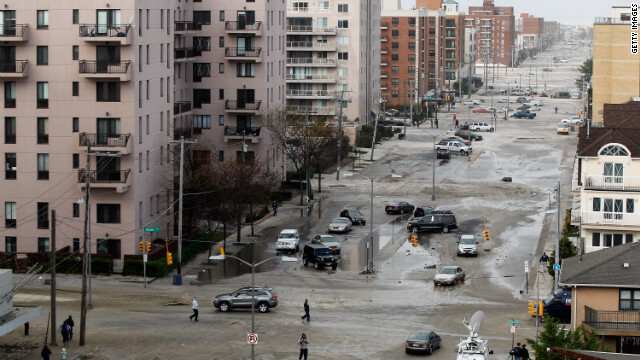 Flood-damaged streets are viewed in the Rockaway section of Queens, New York, where the historic boardwalk was washed away due to Hurricane Sandy. 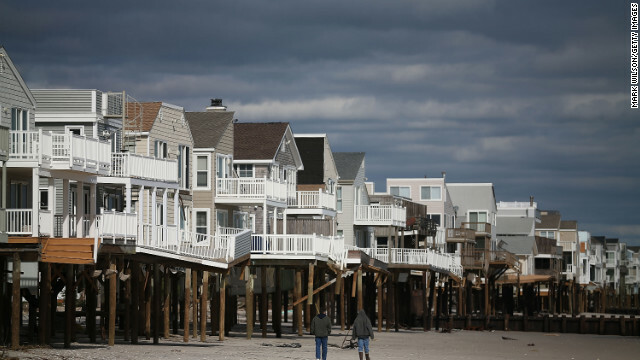 People walk past homes damaged by Hurricane Sandy in Long Beach Island, New Jersey. 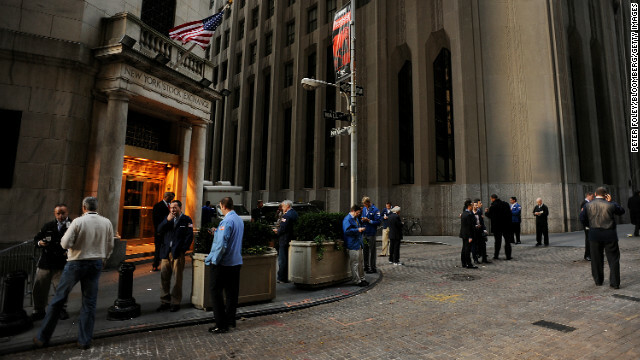 Traders stand outside of the New York Stock Exchange (NYSE) on Wednesday, October 31. U.S. equity markets resumed trading Wednesday for the first time this week after Hurricane Sandy. People board the ferry, one of the few functioning transportation systems, in Hoboken, New Jersey, on Wednesday, October 31. 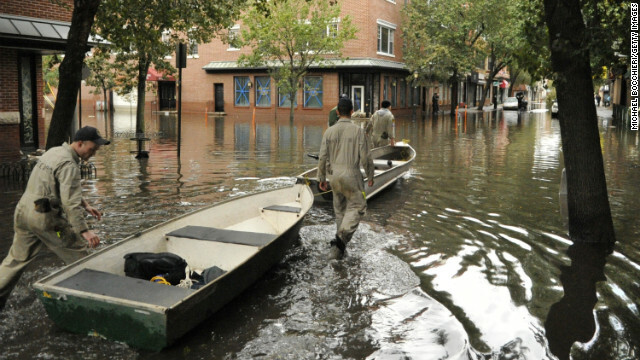 Members of the State University of New York Maritime Academy aid in the relief efforts, using row boats to help victims from in Hoboken, New Jersey. Jimmy Lee, owner of The Nail Store, begins the cleanup of his shop from damage done by Hurricane Sandy in Hoboken, New Jersey. 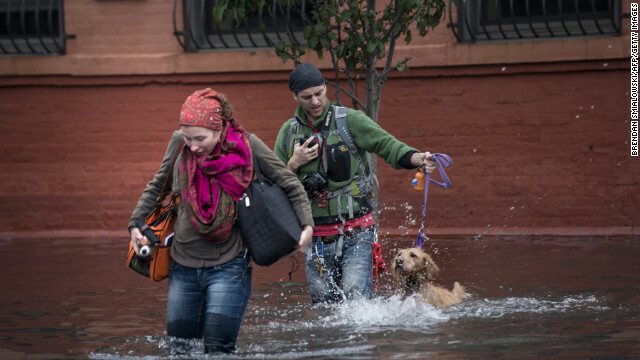 Blaine Badick and her fiancee Andrew Grapsas cross a flooded street with their dog while leaving their home in Hoboken. 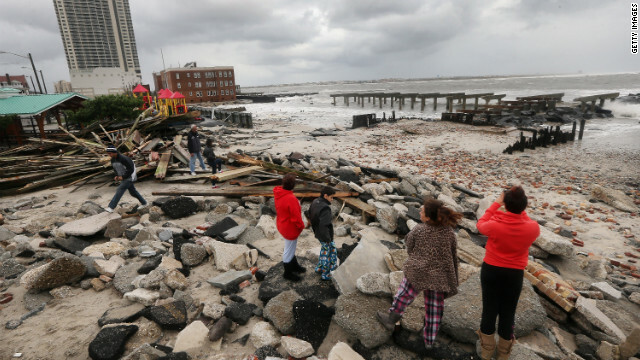 Residents walk through the area where the boardwalk was washed away in the Rockaway neighborhood of Queens, New York, on Wednesday. 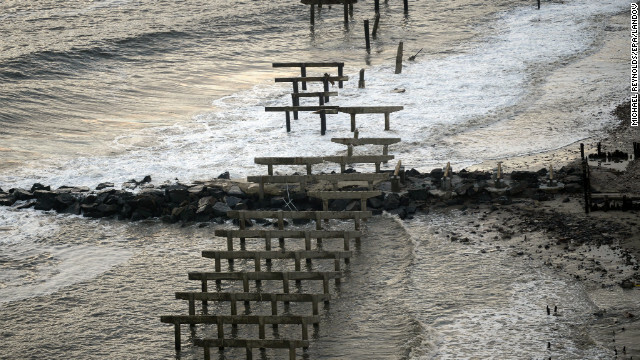 The Rockaway boardwalk in Queens, New York, was stripped down to the piers by Superstorm Sandy. 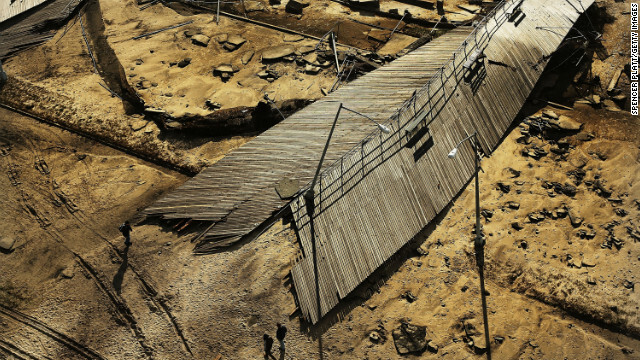 People look at a damaged section of the Rockaway boardwalk in Queens, New York, on Wednesday. 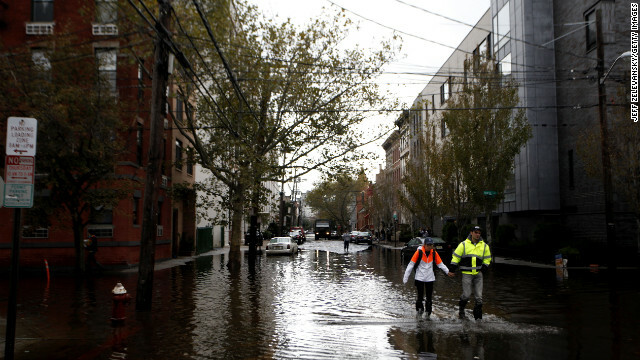 People walk down a flooded street on Wednesday, October 31, in Hoboken, New Jersey. 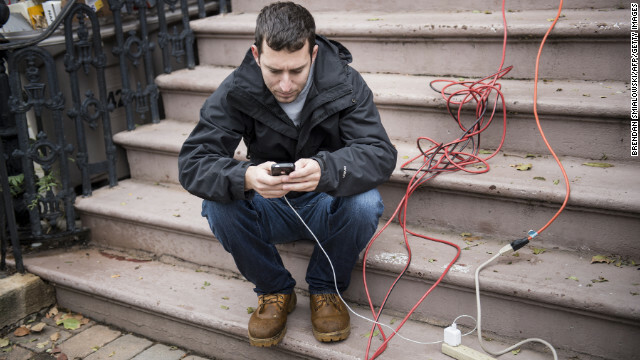 A man charges his cellphone at a home that still has power in Hoboken, New Jersey, on Wednesday, October 31. 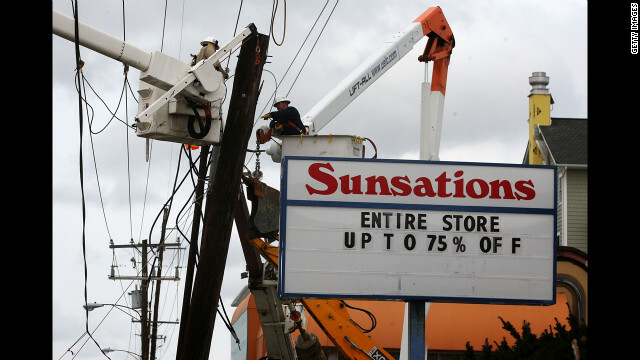 As of Wednesday afternoon, more than 2 million customers in New Jersey were without power. 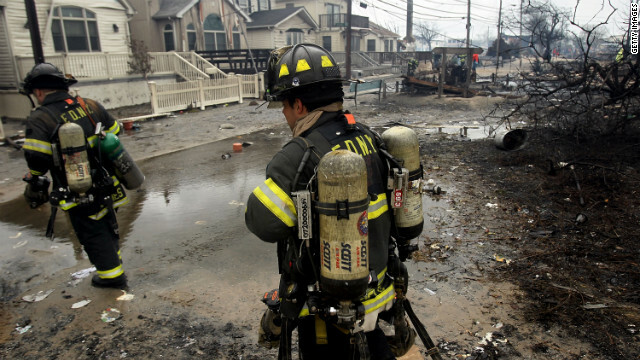 A firefighter stands on the porch of a home destroyed by fire in Queens on Wednesday. 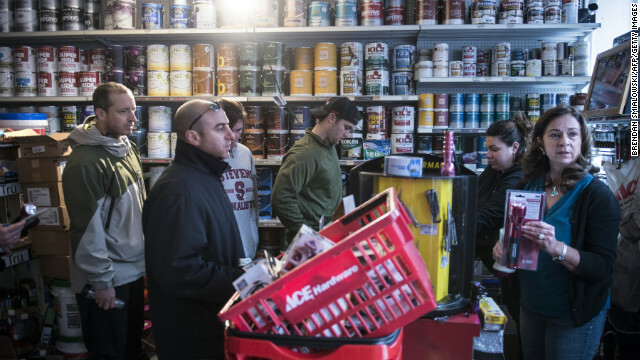 Customers line up to buy supplies at an Ace Hardware with a power generator in Hoboken, New Jersey, on Wednesday. 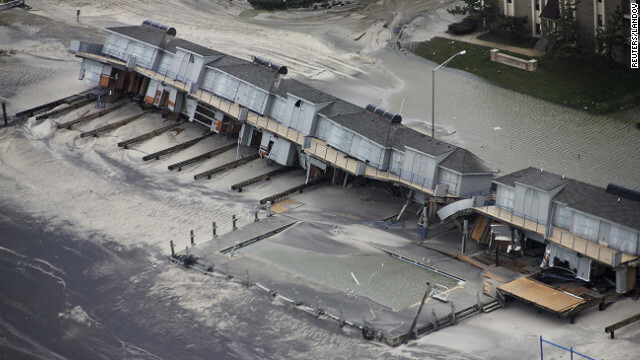 Superstorm Sandy stripped the steps from the deck of this home in Long Beach Island, New Jersey. 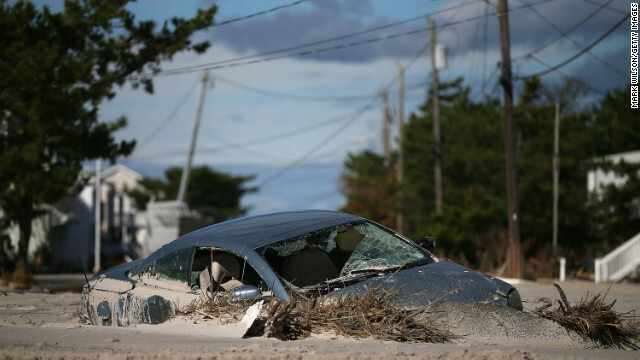 Superstorm Sandy left a car buried in sand in Long Beach Island, New Jersey. 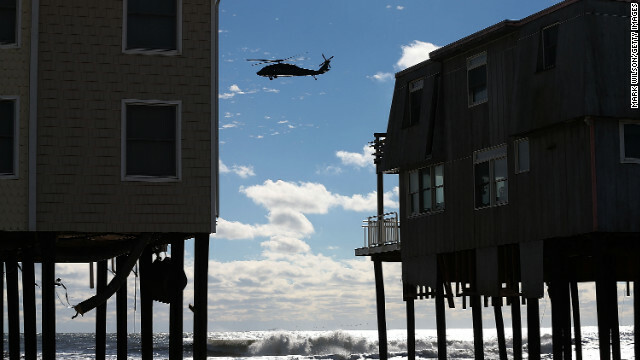 A helicopter flies past damaged homes in Long Beach Island, New Jersey, on Wednesday, October 31. 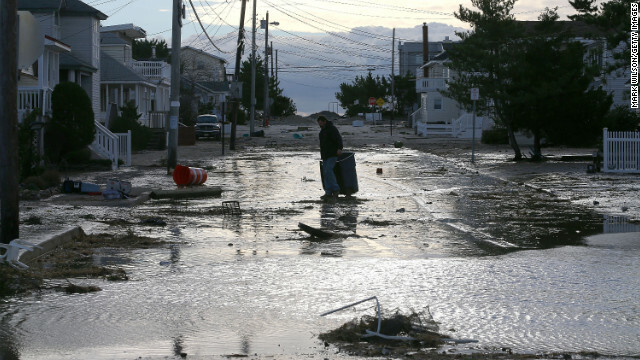 A man makes his way through floodwater and debris in Long Beach Island, New Jersey, on Wednesday. A police car patrols an empty waterfront neighborhood without power in Atlantic City, New Jersey, on Wednesday. 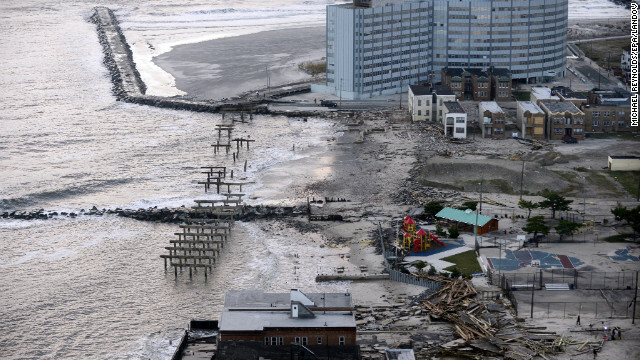 Concrete piers are all that remain of the destroyed boardwalk in Atlantic City on Wednesday. 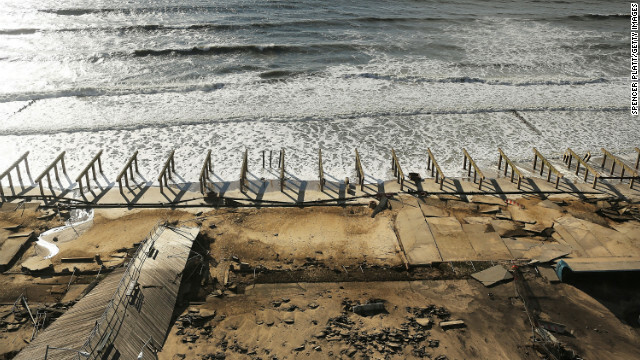 Debris from damaged property and the remains of a boardwalk litter the shoreline in Atlantic City on Wednesday. 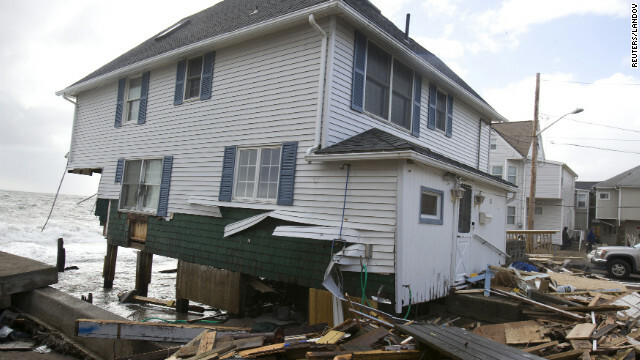 Waterfront property in Atlantic City lays in tatters on Wednesday. Transportation in the state was crippled by floodwaters, as well. "We are in a state of crisis all across this state," Newark, New Jersey, Mayor Cory Booker told CNN on Wednesday. "It's going to be a challenging time." A police car patrols an empty waterfront neighborhood that lost power at dawn in Atlantic City, New Jersey, on Wednesday. 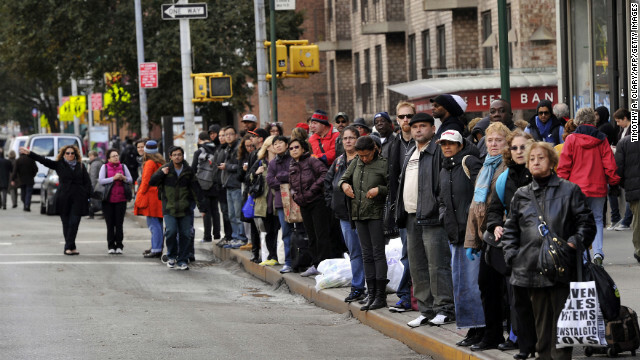 People wait for buses along New York's Sixth Avenue on Wednesday. 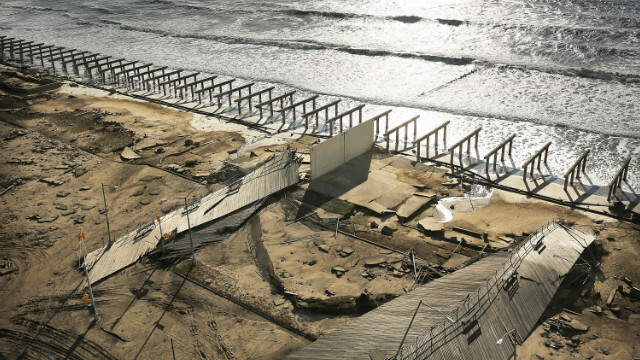 Superstorm Sandy stripped New York's historic Rockaway boardwalk down to its foundation. 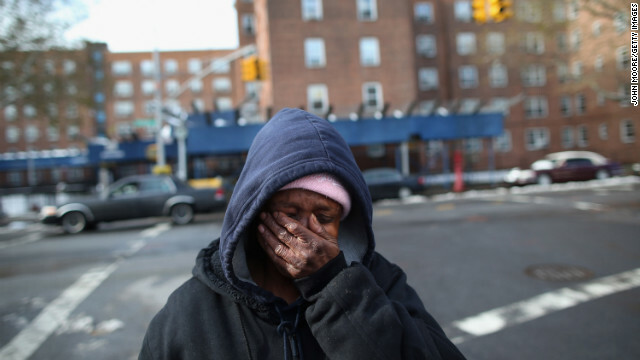 A woman examines damage to the Rockaway neighborhood in New York on Wednesday. 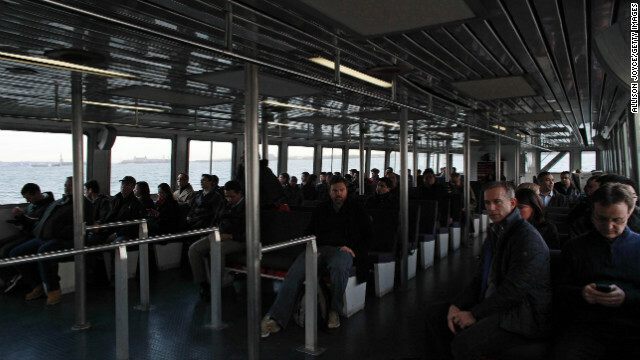 Commuters ride a NY Waterway ferry from Jersey City, New Jersey, on Wednesday, the first day of operation since the storm hit. A man rides on the front of a forklift while recording flood damage for insurance purposes in Little Ferry, New Jersey, on Wednesday. 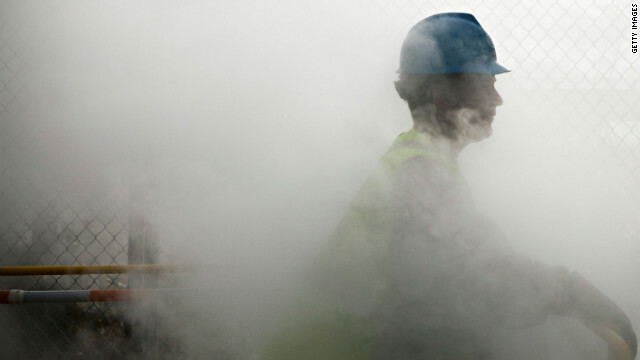 Con Edison employee John Shammah pauses while working on a steam pipe on First Avenue in New York City on Wednesday. CNN iReporter Jordan Shapiro captured this view of the Williamsburg Bridge in New York at 11 p.m. on Tuesday, October 30. 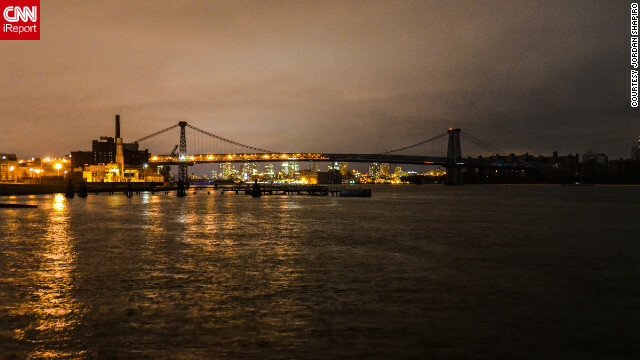 Half of the bridge and Brooklyn is lit, while the Manhattan side and the surrounding part of the island remain shrouded in darkness. 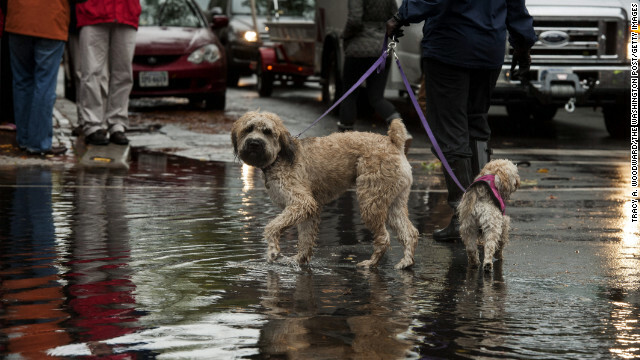 Dog owners in Alexandria, Virginia, gathered to see the flood waters left by Hurricane Sandy on Tuesday. 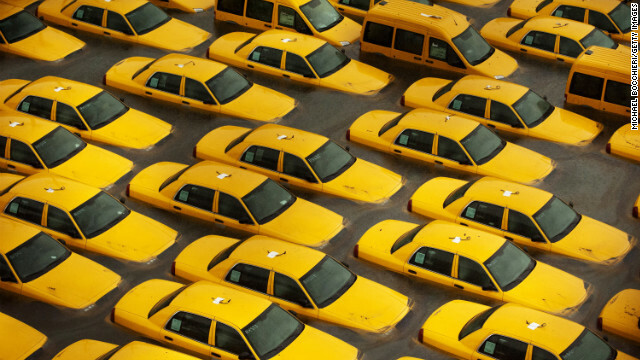 Taxis sit in a flooded lot Tuesday in Hoboken, New Jersey. 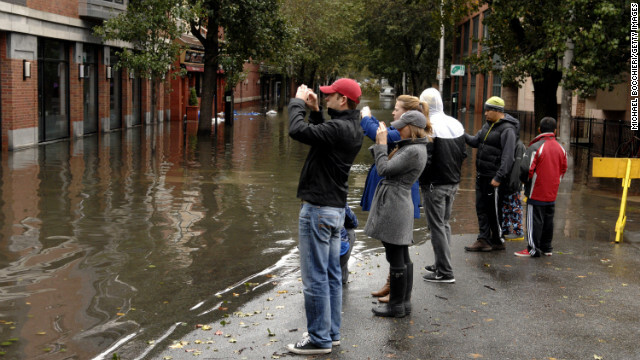 People take pictures of a flooded street Tuesday in Hoboken. 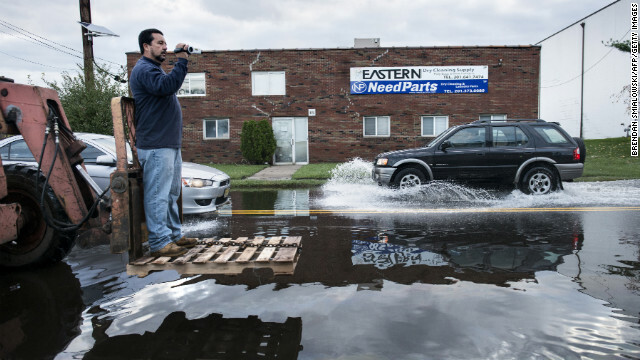 A man stands near a homemade road block on Tuesday in Little Ferry, New Jersey. 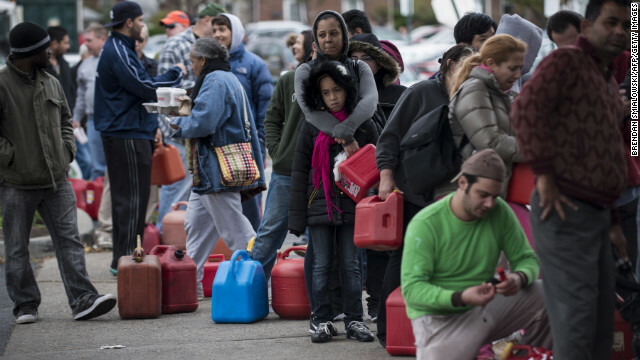 People wait in line to fill containers with gas at a Shell station in Edison, New Jersey, on Tuesday. 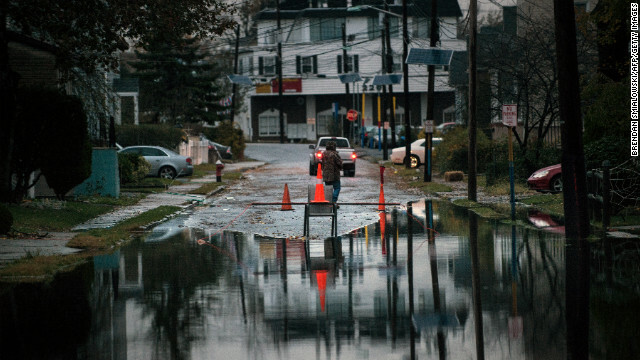 Superstorm Sandy left much of Bergen County flooded and without power. 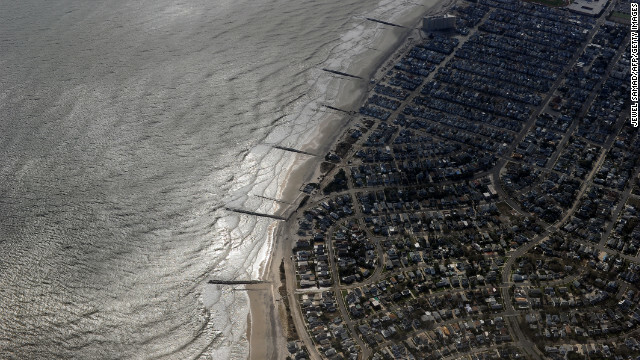 Aerial images from the U.S. Coast Guard show the coastline in Brigantine, New Jersey, on Tuesday. 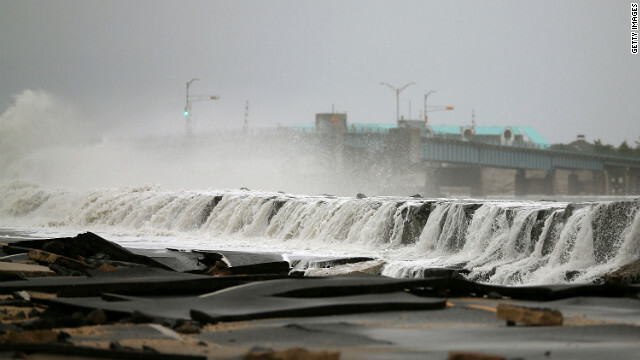 Sandy struck land near Atlantic City, New Jersey, around high tide Monday night. 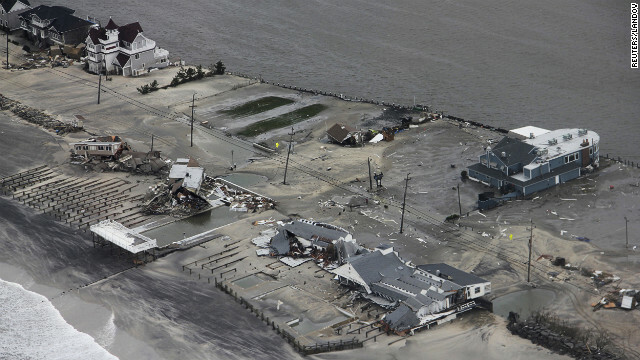 Homes and other buildings in Brigantine were destroyed in Sandy's wake. New Jersey Gov. 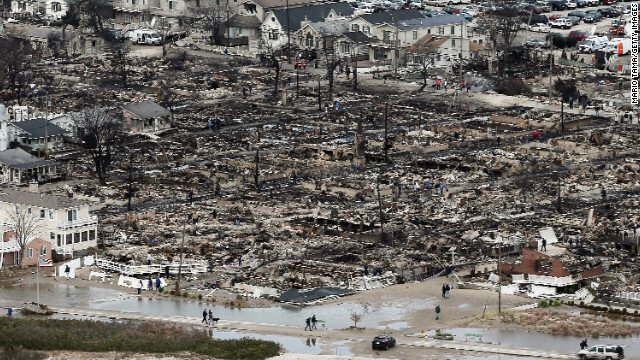 Chris Christie described the devastation in the state as "unthinkable." 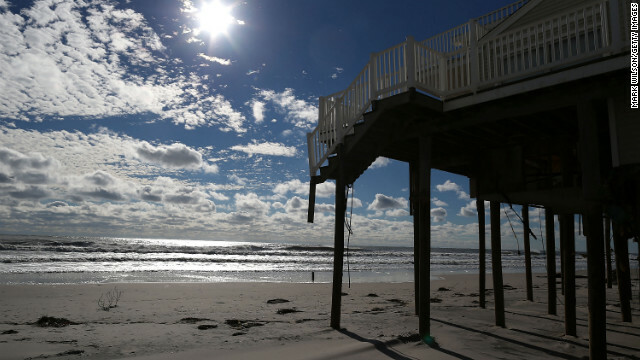 Brigantine saw extensive damage from high winds and flooding. 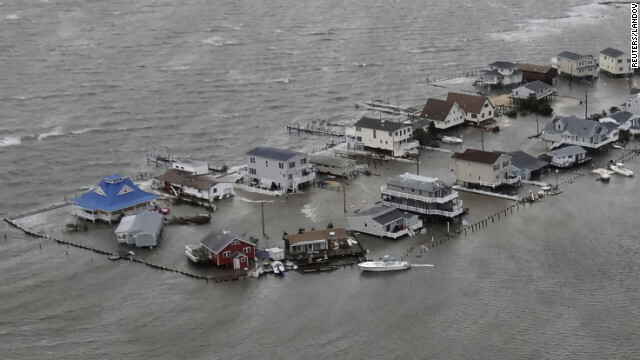 Homes are flooded Tuesday in Tuckerton, New Jersey. 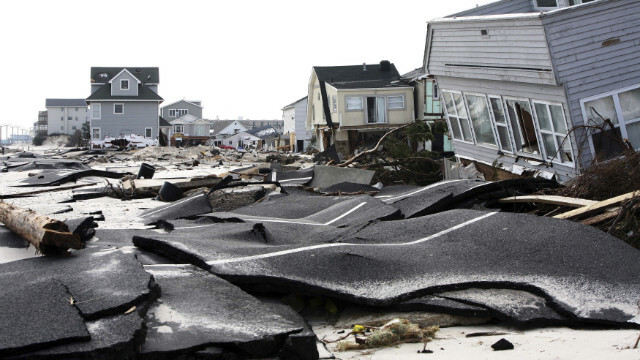 President Barack Obama signed major disaster declarations for New Jersey and New York, clearing the way for federal aid. 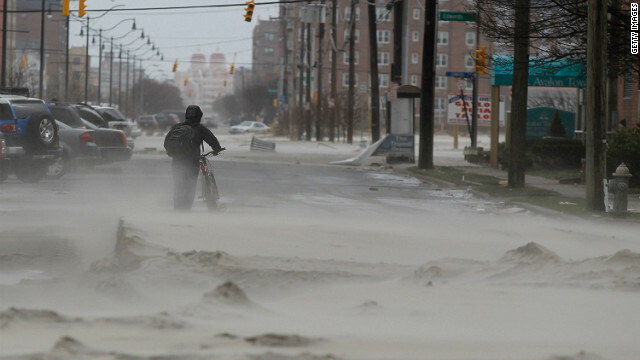 A resident walks down a street covered in beach sand due to flooding from Hurricane Sandy in Long Beach, New York on Tuesday. Ted Wondsel, owner of Ted's Fishing Station in Long Beach, assesses the damage to his business Tuesday. People wait outside a shelter at the Bergen County Technical Schools Teterboro Campus on Tuesday in Hasbrouck Heights, New Jersey. Utility workers from Delmarva Power replace a power pole that was damaged during Hurricane Sandy in Ocean City, Maryland, on Tuesday. 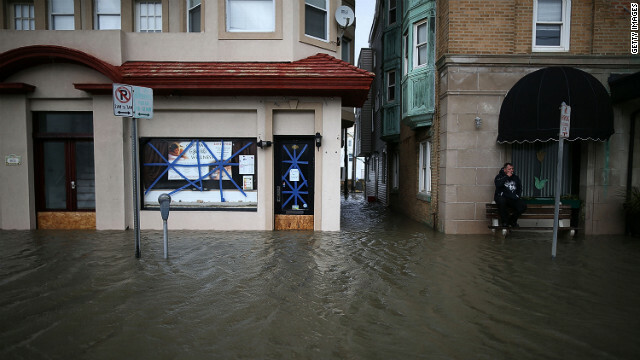 Dale Kelly sits on a bench Tuesday on a flooded street in Ocean City, New Jersey, which was hit hard by Superstorm Sandy. 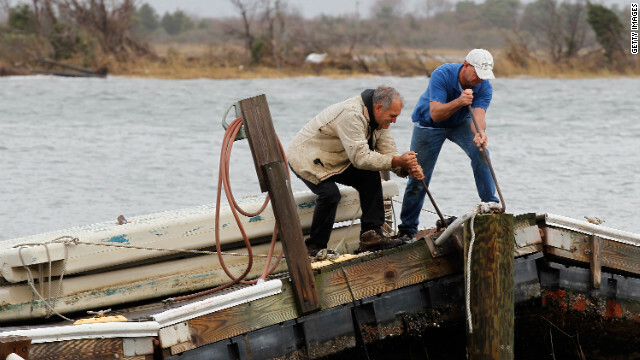 Ted Wondsel, left, of Point Lookout works on part of a dock destroyed in the storm in Long Beach on Tuesday. West Broadway in Long Beach is covered in beach sand due to flooding from Hurricane Sandy on Tuesday. 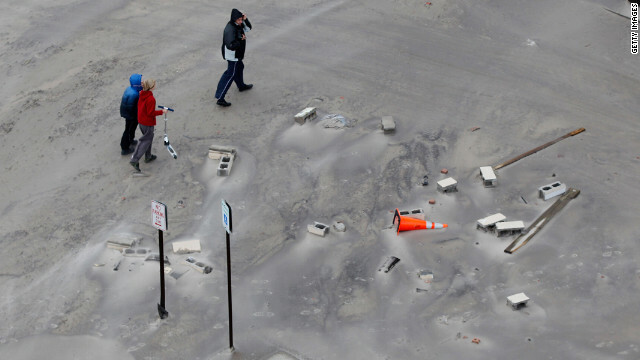 Residents walk along a street covered in beach sand after floodwaters from Superstorm Sandy retreated Tuesday in Long Beach. 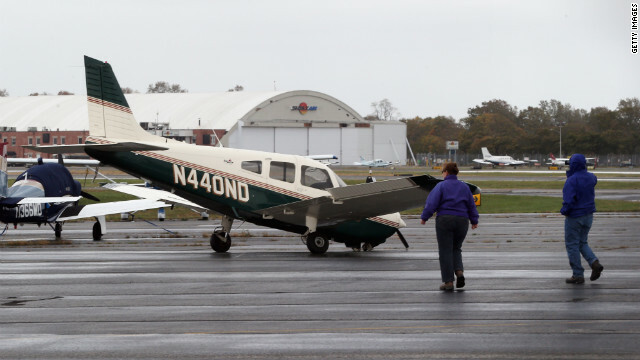 A small plane damaged in the storm sits on a runway in Farmingdale, New York, on Tuesday. 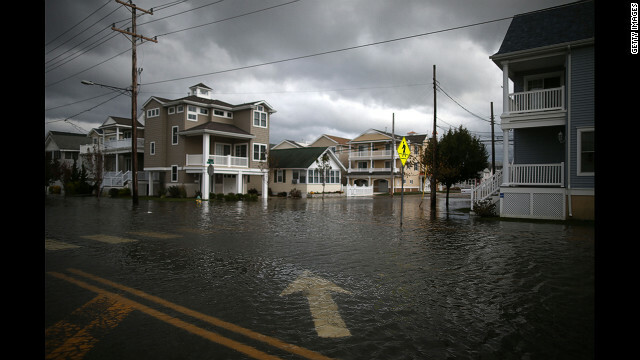 Streets remain flooded in portions of Ocean City, New Jersey. 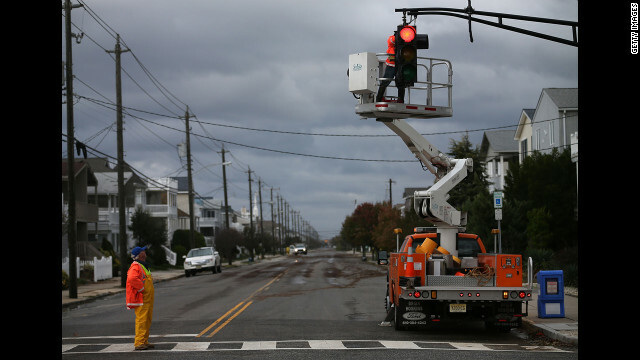 Utility workers repair a traffic signal damaged by the storm in Ocean City, New Jersey, on Tuesday. 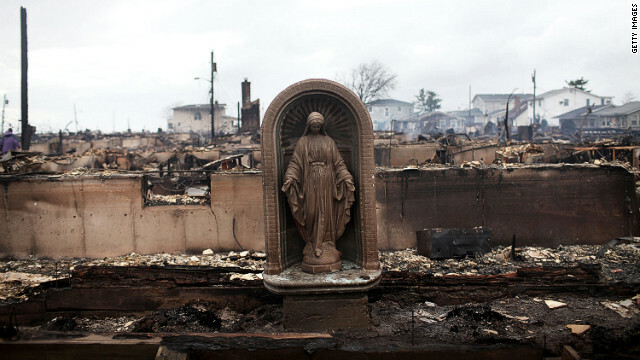 A Virgin Mary statue stands in the Breezy Point neighborhood of Queens, New York, on Tuesday after a fire fed by high winds destroyed at least 80 homes, officials said. 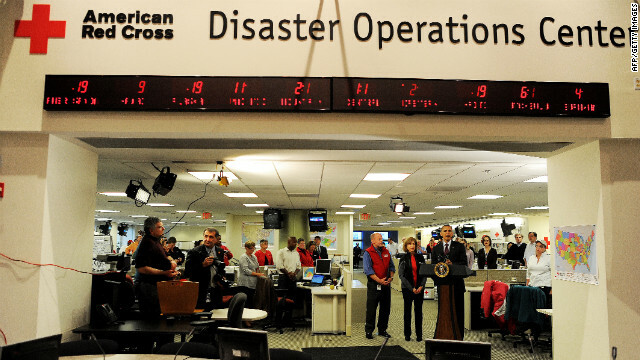 President Barack Obama outlines the federal government's response to Superstorm Sandy at the Red Cross headquarters in Washington. 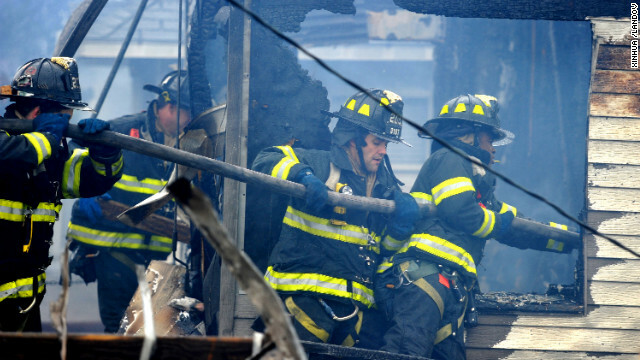 Firefighters work to contain the fire in Queens on Tuesday. Some 200 firefighters battled the six-alarm blaze. 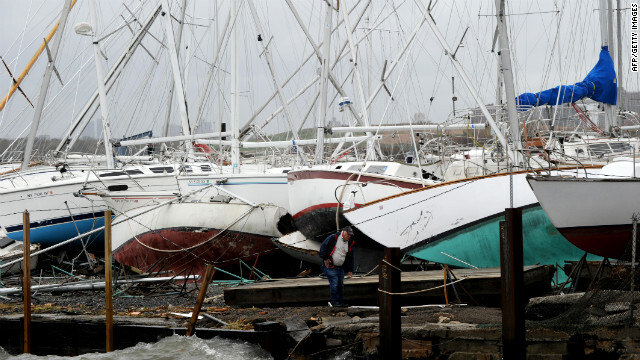 A man surveys damage to sailboats Tuesday at a marina on City Island in New York. "My message to the federal government: no bureaucracy, no red tape, get resources where they're needed as fast as possible, as hard as possible, and for the duration," Obama said in Washington Tuesday. 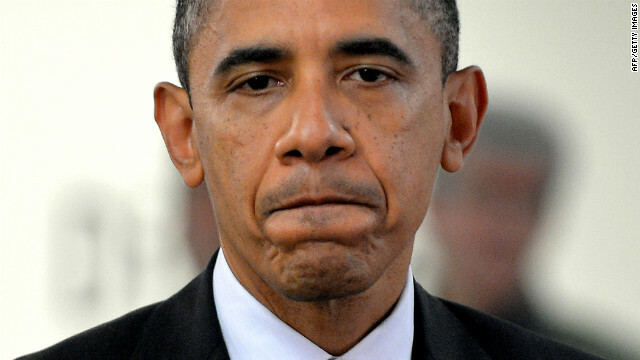 Both Obama and Republican presidential candidate Mitt Romney canceled campaign events. 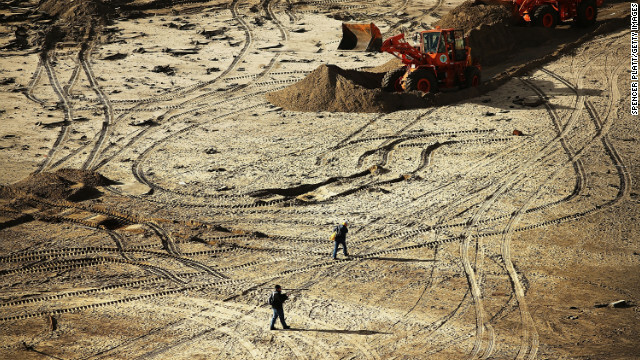 People stand on a mound of construction dirt on Tuesday to view a section of the uptown boardwalk in Atlantic City, New Jersey, that was destroyed by flooding. 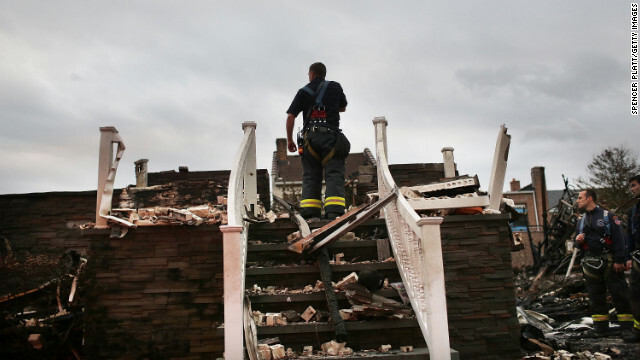 A firefighter looks through debris in Queens on Tuesday. In September, the same area endured severe weather as a powerful cold front brought heavy rain, high winds and a tornado. 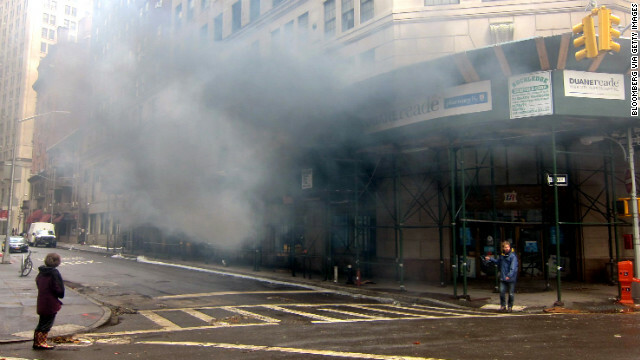 A malfunctioning generator billows black smoke at a building in New York on Tuesday. 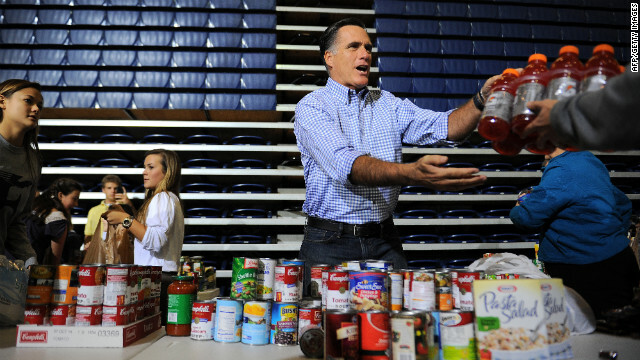 Mitt Romney helps gather donated goods for storm relief Tuesday in Kettering, Ohio. 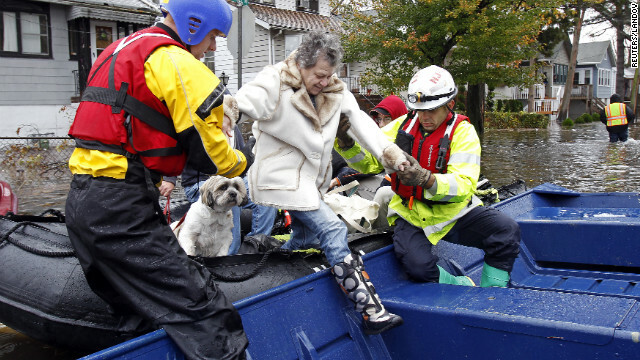 Emergency personnel help a resident of Little Ferry, New Jersey, onto a boat after rescuing her from floodwater on Tuesday. Dean Walter, left. and Henry Young walk along a seawall in Scituate, Massachusetts, with their surfboards after going into the heavy surf for about 20 minutes on Tuesday. 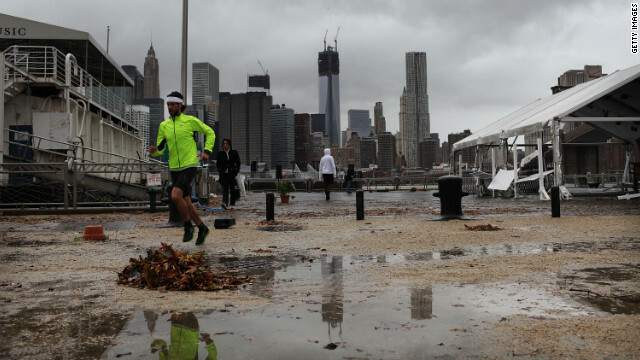 Superstorm Sandy left New York's South Street Seaport flooded and covered in debris on Tuesday. 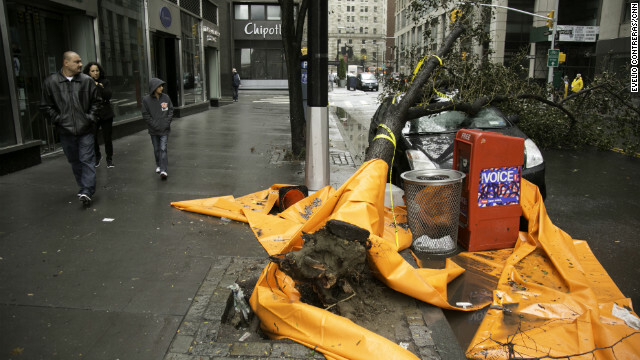 Passers-by look at a car that was crushed by a tree near New York's financial district on Tuesday. 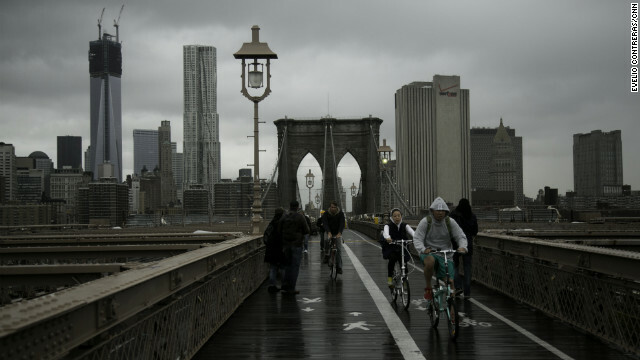 Pedestrians and bikers cross the Brooklyn Bridge after the storm on Tuesday. 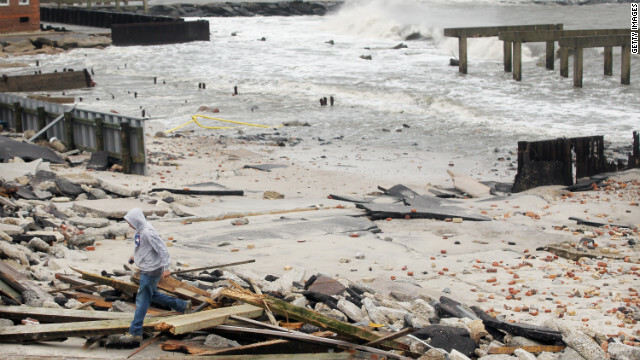 People stand among the debris of the destroyed section of Atlantic City, New Jersey's, uptown boardwalk on Tuesday. 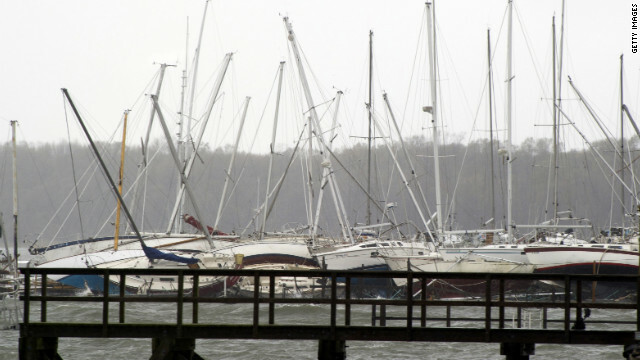 Sailboats rest on the ground after being tipped over by Superstorm Sandy on City Island, New York, on Tuesday. 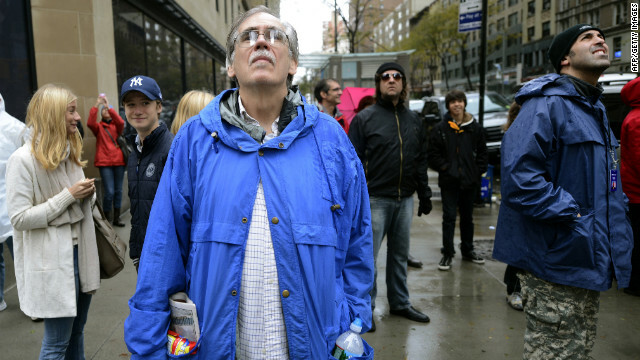 Onlookers watch a dangling crane, damaged in the winds of Superstorm Sandy, atop a luxury high-rise under construction in midtown Manhattan on Tuesday. 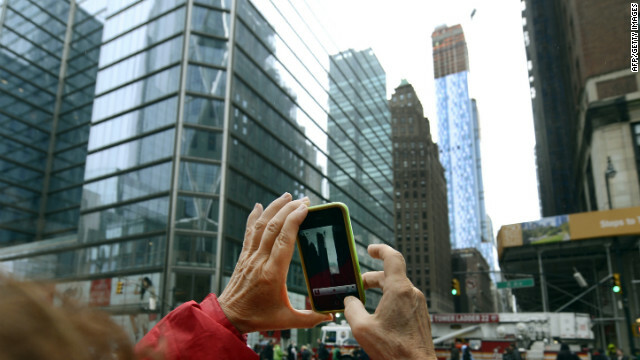 An onlooker snaps a photo of the damaged crane on Tuesday. 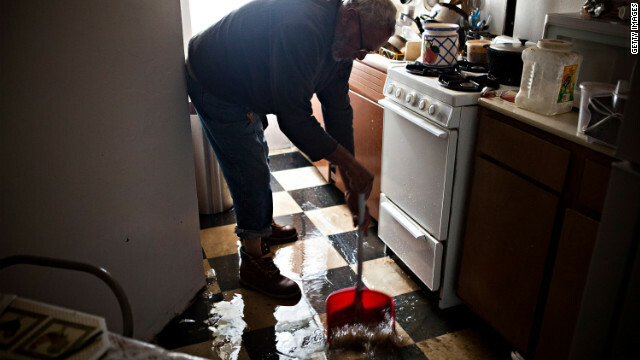 Jolito Ortiz helps clean up a friend's apartment on New York's lower east side on Tuesday. 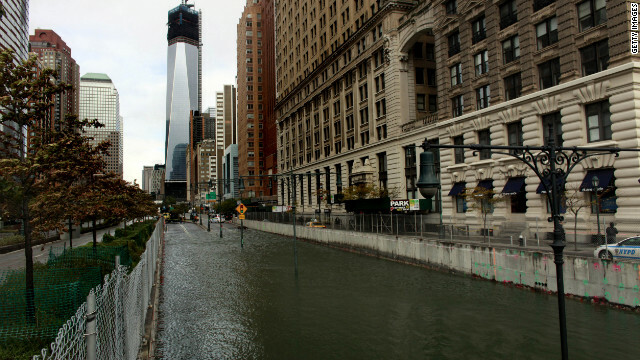 A tidal surge created by Sandy flooded the Brooklyn Battery Tunnel in New York on Tuesday. 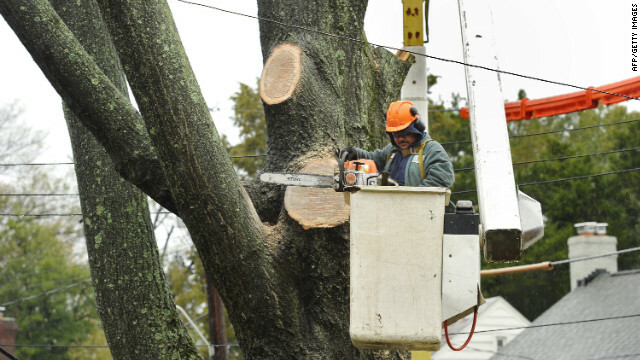 A worker cuts down a tree near American University in Washington on Tuesday. 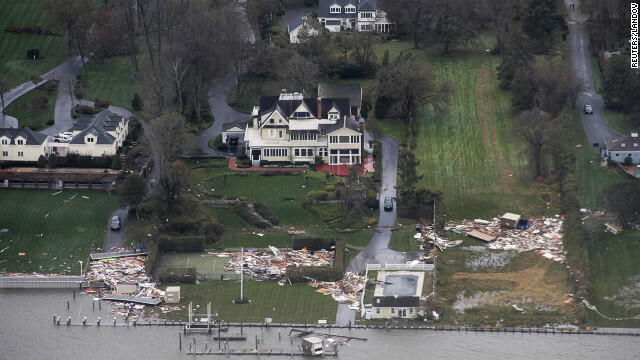 A home badly damaged by Superstorm Sandy sits along the shoreline in Milford, Connecticut, on Tuesday. 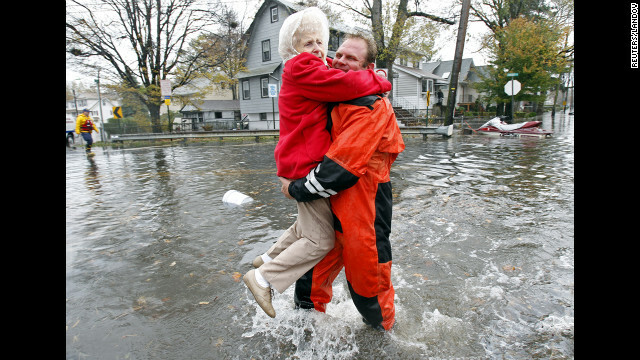 An emergency worker carries a resident through floodwaters in Little Ferry, New Jersey, on Tuesday. Police walk past debris left by the storm at Battery Park in New York on Tuesday. 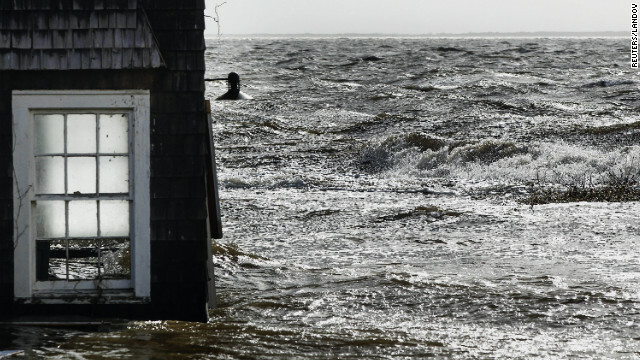 Floodwater splashes into the window of a building on the shore in Bellport, New York, on Tuesday. 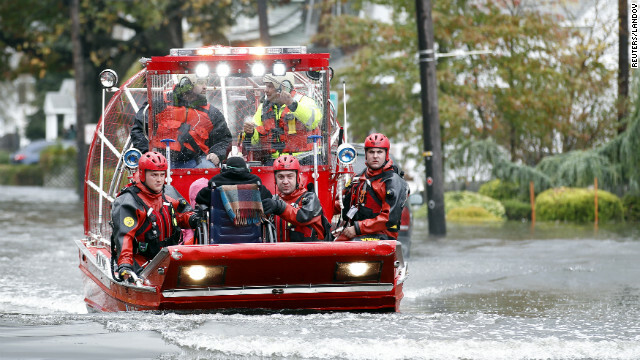 Rescue workers use a hovercraft to rescue a resident using a wheelchair from floodwaters in Little Ferry, New Jersey, on Tuesday. 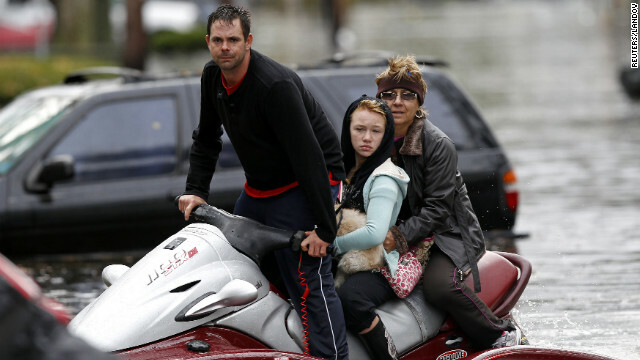 A resident of Little Ferry, New Jersey, assists in rescue efforts with his personal watercraft on Tuesday. 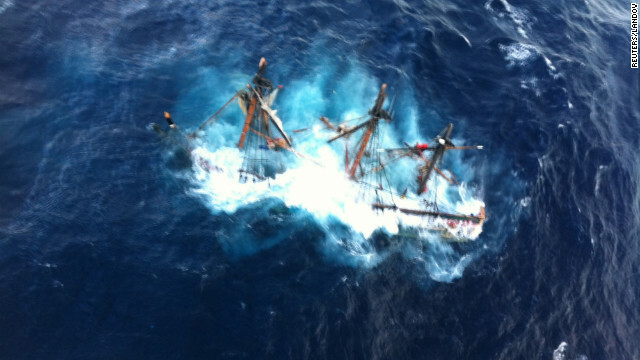 The HMS Bounty, a 180-foot sailboat, is submerged in the Atlantic Ocean about 90 miles southeast of Hatteras, North Carolina, on Monday, October 29. 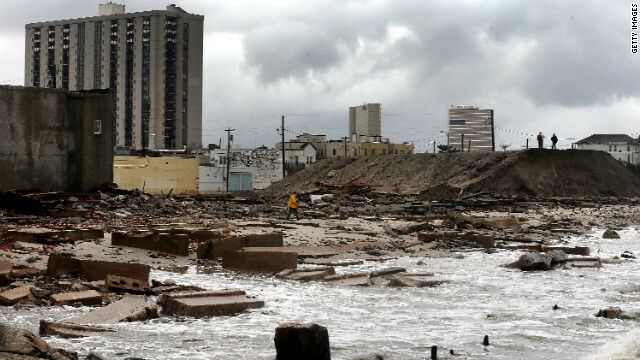 A man walks through the debris of a 2,000-foot section of Atlantic City, New Jersey's "uptown" boardwalk on Tuesday. It was destroyed by flooding from Sandy. 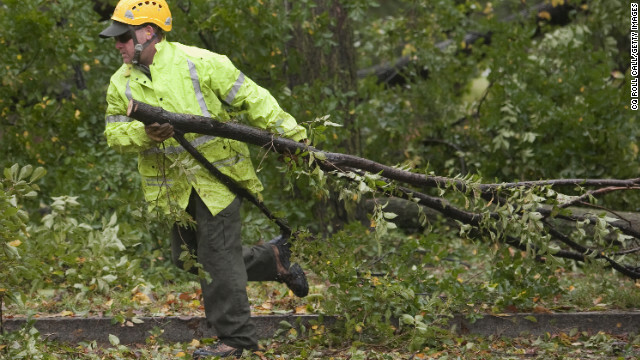 Downed trees are removed near the Korean War Veterans Memorial in Washington on Tuesday. Heavy surf buckles Ocean Avenue in Avalon, New Jersey, on Tuesday. 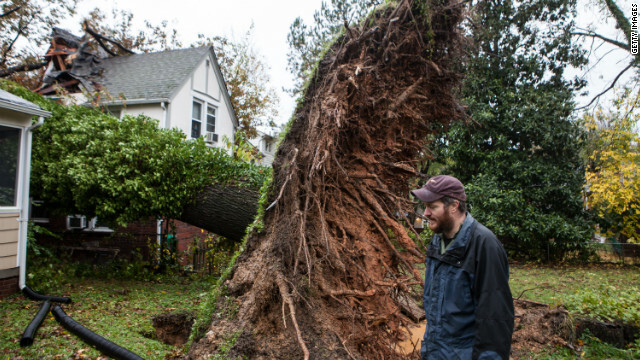 Sam Rigby walks on Tuesday near an uprooted tree that grazed his house and hit his neighbor's house in Washington. 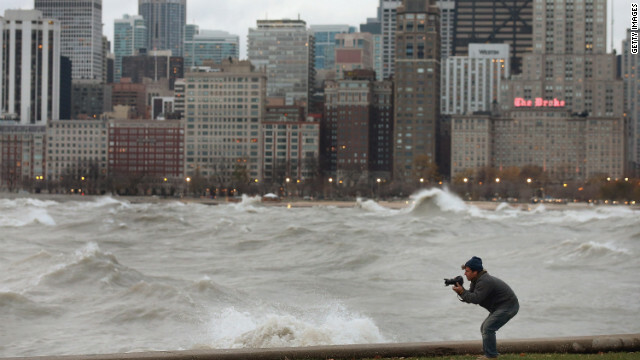 A photographer shoots waves in Lake Michigan generated by the remnants of Sandy as they crash into the Chicago shoreline on Tuesday. 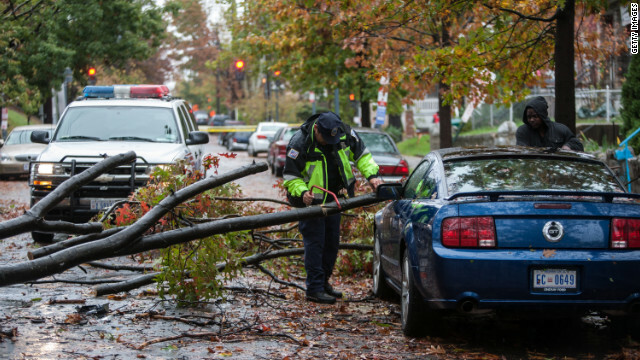 A police officer helps remove a tree branch brought down during the storm in Washington on Tuesday. 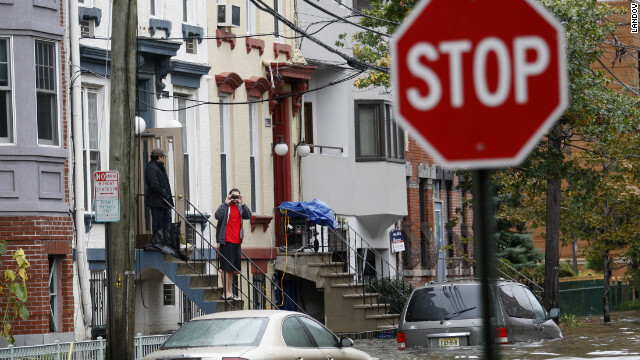 A man takes pictures of cars from the steps of a home on a flooded street at Hoboken in New Jersey, on Tuesday. 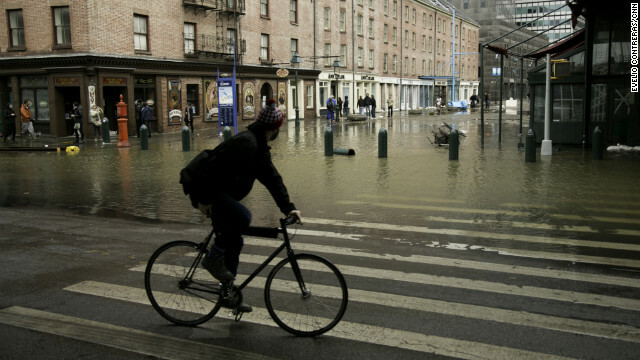 A woman wades through water at the South Street Seaport in New York City on Tuesday. 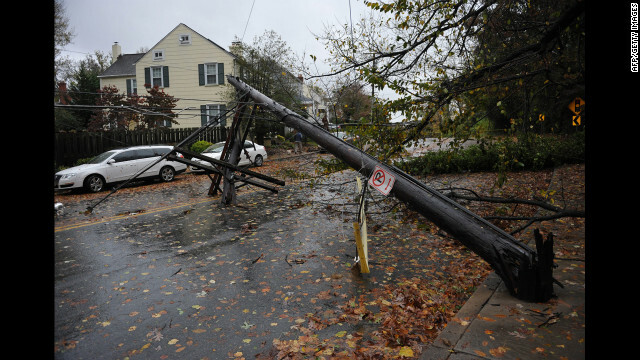 A street light and utility pole lie on the street in Avalon, New Jersey, on Tuesday. 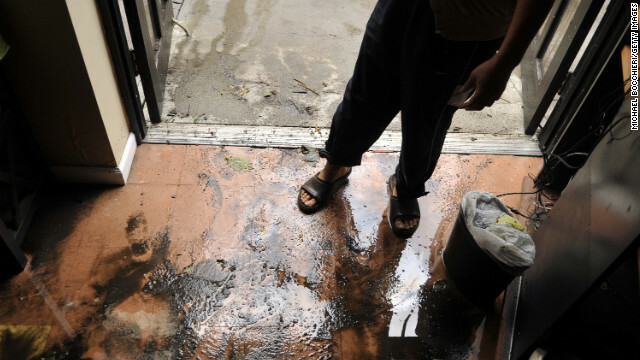 Atlantic City, New Jersey, resident Kim Johnson inspects the area around her flooded apartment building on Tuesday. A power line knocked over by a falling tree blocks a street in Chevy Chase, Maryland, on Tuesday. 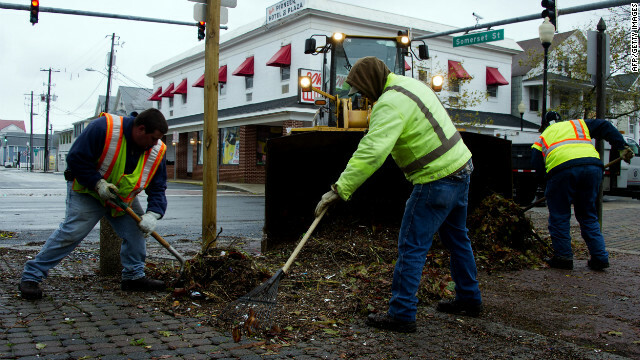 Workers shovel debris from the streets in Ocean City, Maryland, on Tuesday. 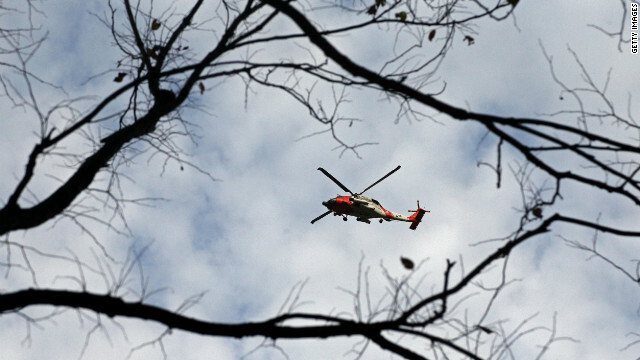 A U.S. Coast Guard helicopter flies over Central Park in New York on Tuesday. A man jogs near a darkened Manhattan skyline on Tuesday after much of New York City lost electricity. 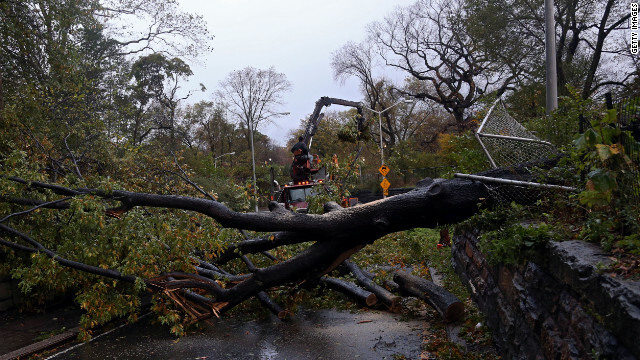 Workers clear a tree blocking East 96th Street in Central Park in New York on Tuesday. View more photos of the recovery efforts in New York. Editor's note: Julian Castro is the U.S. secretary of housing and urban development. Judith Rodin is the president of The Rockefeller Foundation and author of "The Resilience Dividend: Being Strong in a World Where Things Go Wrong." The views expressed are their own. (CNN) -- From superstorms to floods, to historic heat waves and droughts, not a week goes by without a major disruption somewhere in our communities. Between 2011 and 2013, 48 states and two-thirds of American counties endured crises severe enough to be declared major disasters. Of course, these events aren't preventable, but there are often steps we can take to change how we prepare and respond. Indeed, with the right preparation, not every extreme weather disruption has to become a disaster. 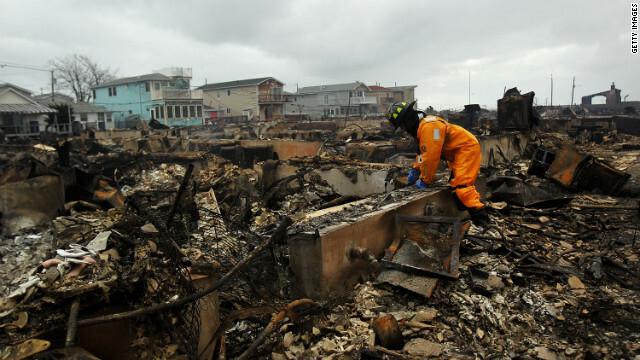 Hurricane Sandy underscores what can be done. 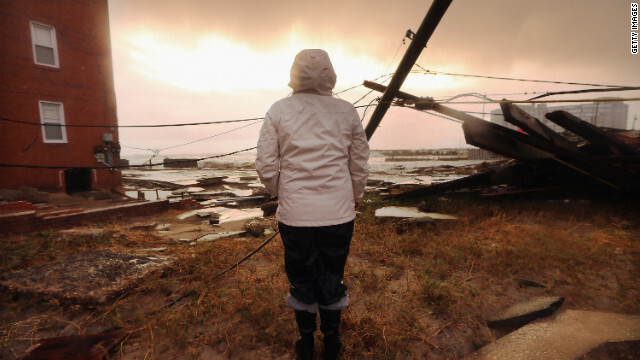 The deadly 2012 storm was devastating for communities along the Eastern Seaboard. But the Department of Housing and Urban Development and the Rockefeller Foundation asked the question: What if we focused on planning and preparing as much as we do on disaster reaction and response? So we partnered to create Rebuild by Design, a competition that brings together engineering and design experts with public, philanthropic and community organizations to try to find ways of rebuilding that make communities like those affected in New York and New Jersey more environmentally and economically resilient. And now the competition is hitting the national stage, with the HUD-led $1 billion National Disaster Resilience Competition, which is aimed at encouraging local businesses, community development organizations, nonprofits, and local and state governments to rethink how cities plan in the face of a growing number of natural disasters. In November, we convened a summit of leaders from 67 competing states, cities, counties and parishes. Now, government officials and civic leaders as well as engineers, architects and urban planners will participate in boot camp-like resilience academies to understand best practices before they submit their proposals. The first one, designed for the challenges facing the Southeast in particular, is being held this week in Atlanta, followed by other dedicated regional academies across the country in the new year. 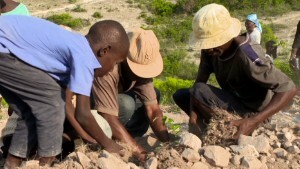 Can planting trees fight natural disasters? This billion-dollar investment turns the traditional idea of disaster relief on its head. For years, communities have received federal recovery funds after the fact -- when they were knocked on their heels by a disaster. Unsurprisingly, this is also a particularly expensive way of doing business. This new approach, in contrast, will ultimately save communities millions in long-term costs. The Federal Emergency Management Agency suggests that every dollar we invest in resilience before a disaster saves $4 after the fact. So, in a way, this was an idea that we couldn't afford not to do. We call the philosophy behind this competition the "resilience dividend," and it pays off by improving our everyday lives in the good times, too. Take Tulsa, Oklahoma, which over the last century has often experienced flooding. Since the city began planting parks in floodplains and changing the way it designs its buildings, Tulsa's residents have been paying some of the lowest insurance rates in the country and worrying less about losing their homes and property. The quality of their lives and their sense of economic security has grown. Or consider Boulder, Colorado. 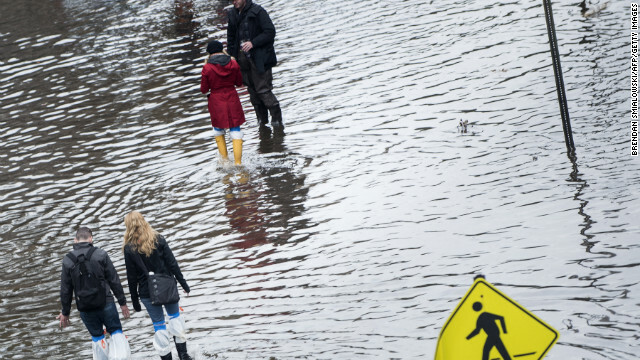 After a bout of historic rainstorms there, a public-private partnership designed storm drains that double as bicycle trails, floodgates doubling as transportation routes, and recreation areas that protect water quality. And New Orleans, which was devastated by flooding from Hurricane Katrina 10 years ago next year, reimagined its economic base in rebuilding itself, encouraging innovation and entrepreneurship and creative and sustainable development. A decade after large areas were submerged, New Orleans is recognized as a hotbed for startups and one of America's most resilient cities. Rebuild by Design is succeeding not only because of the creativity of the projects, but also due to the collaboration of multidisciplinary teams of engineers, architects, planners and, importantly, local communities -- all of which partnered in unprecedented ways. Of crucial value, the teams spent considerable time on the ground in these communities, building critical trust and listening to citizens about their needs. For example, one of the winning groups in the competition proposed a 10-mile flood barrier to protect Lower Manhattan -- called the "Big U" -- that would not only be functional and effective, but also aesthetically appealing. Drawing on local input, the design incorporated green space, bike paths, art and community markets that create economic opportunity in underdeveloped areas, all while protecting against future flooding. Building resilience is a process with no ideology: Natural disasters in our country are destroying Republican and Democratic communities alike. But the National Disaster Resilience Competition is providing common-sense solutions that create common ground on which to work together. The time to embrace resilience is now.